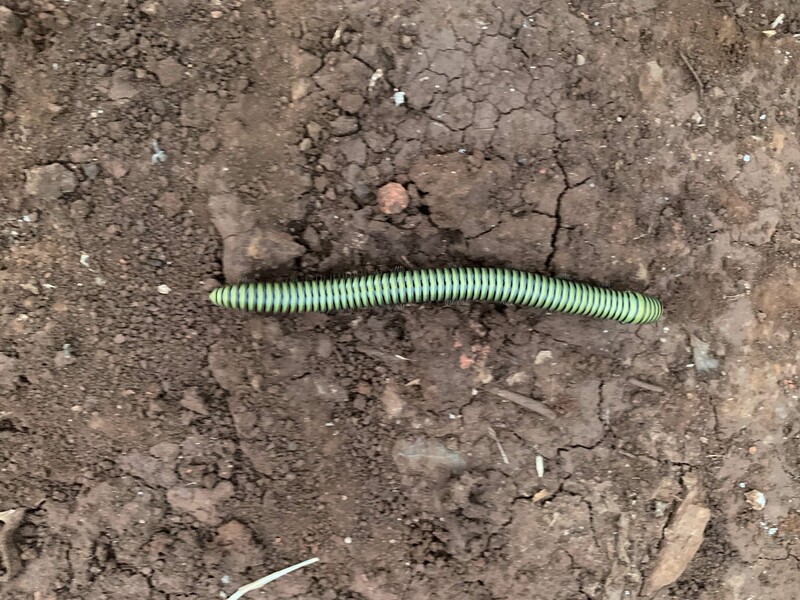 Sunday, March 17 – St. Patrick’s Day in the Crater with the rhinos…. 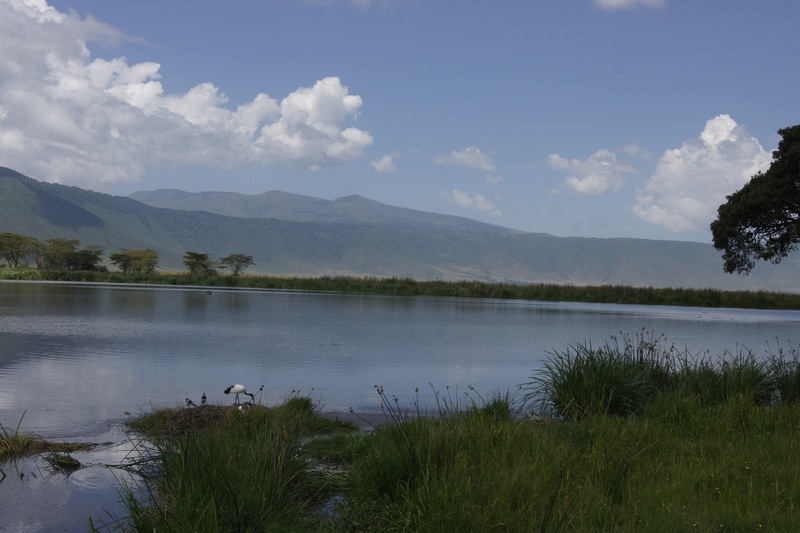 Ngorongoro Crater is truly one of the wonders of the world. Its name is actually a misnomer as it is really not a crater, but a caldera formed by the collapse of a massive volcano some 2.5 million years ago. 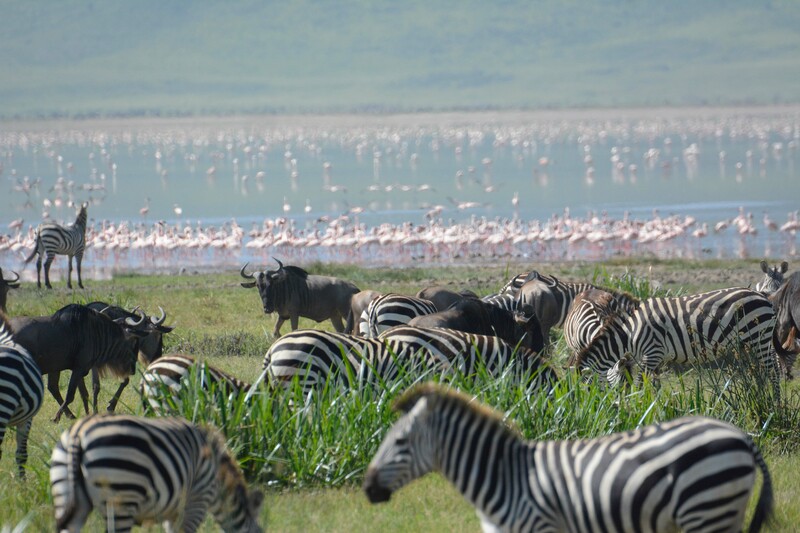 In fact, it is the largest dry caldera in the world, measuring 10-12 miles in diameter and two thousand feet deep, with a large lake in the middle and thousands upon thousands of animals that remain in the crater year-round and are not part of the Great Migration. 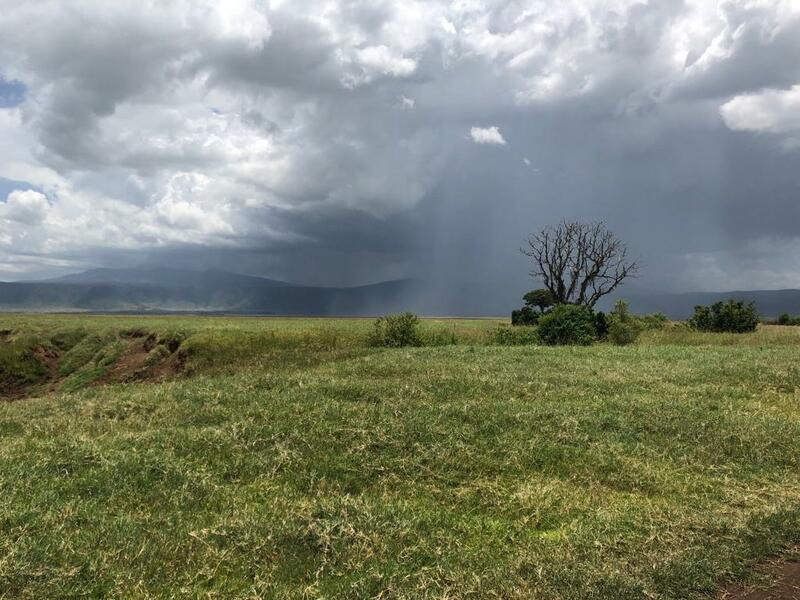 Most every animal that is in the Serengeti can be found in the crater other than the Nile crocodile (there are no flowing rivers in the crater to sustain them) and the giraffe, as the crater walls are far too steep for its access. 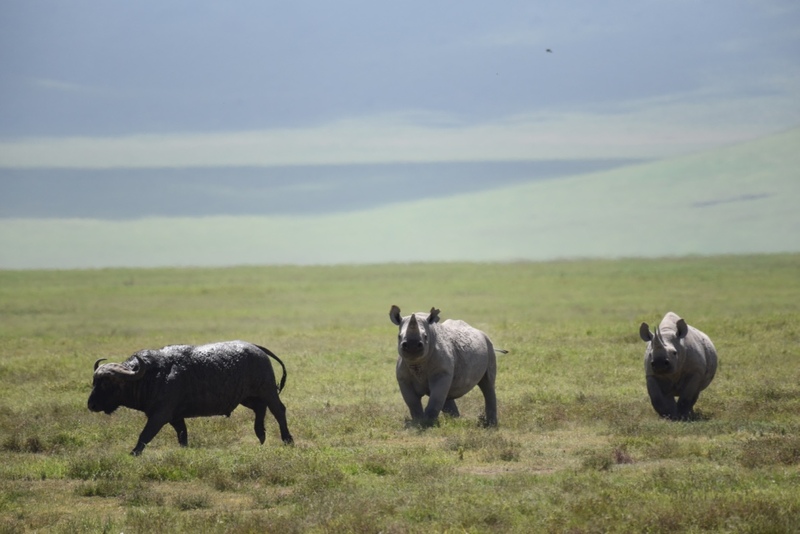 One animal that the crater has and is known for, though, is the endangered black rhino that was near extinction not long ago and thanks to the dedicated conservation efforts of many in Tanzania, it has been increasing in numbers. The rhinos in the crater are all monitored at every moment so that the rangers know were each one is at any given time which has led to an increase in their numbers. 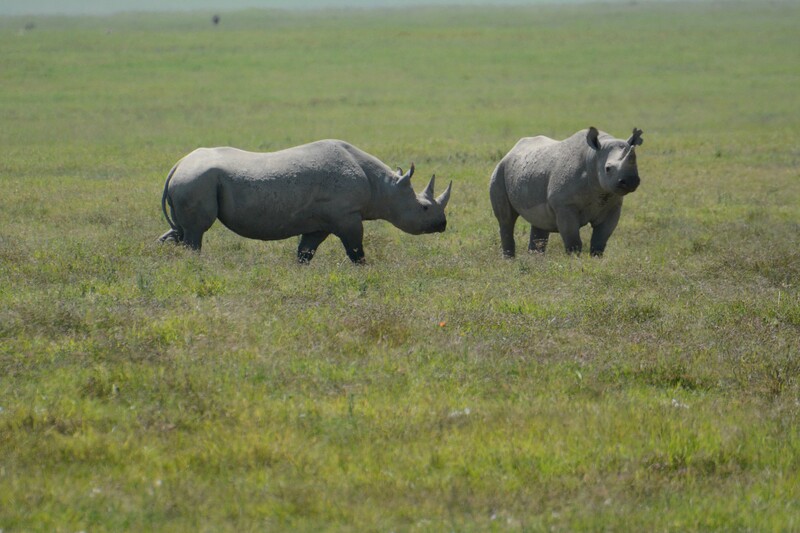 There are also black rhinos in the Serengeti, but the populations are quite separate. 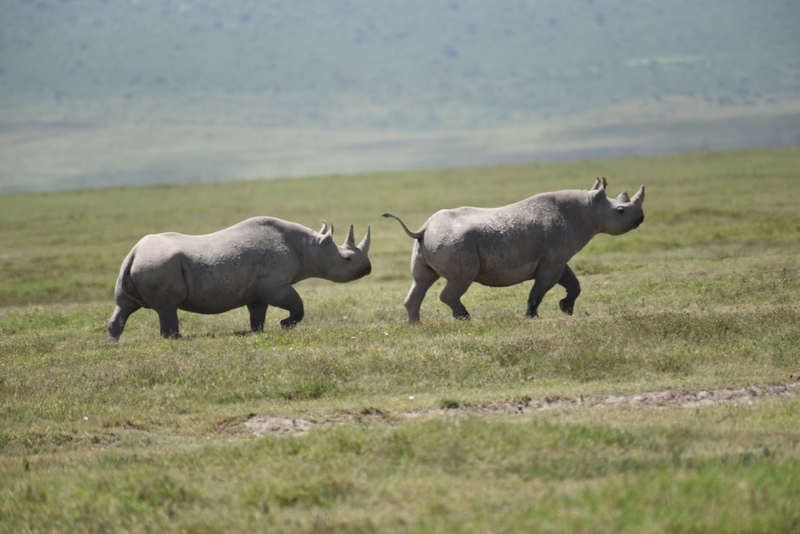 The rhinos have very poor eyesight and, therefore, depend primarily on their hearing for defense which means that they are rarely out when it is windy in the crater. When I first came to the crater, I did not see a rhino and it took me several other trips there until I had finally spotted one. I have seen many since, but never very close, at least not in the crater. Going into the crater today, in addition to seeing big cats, we were looking for rhinos. 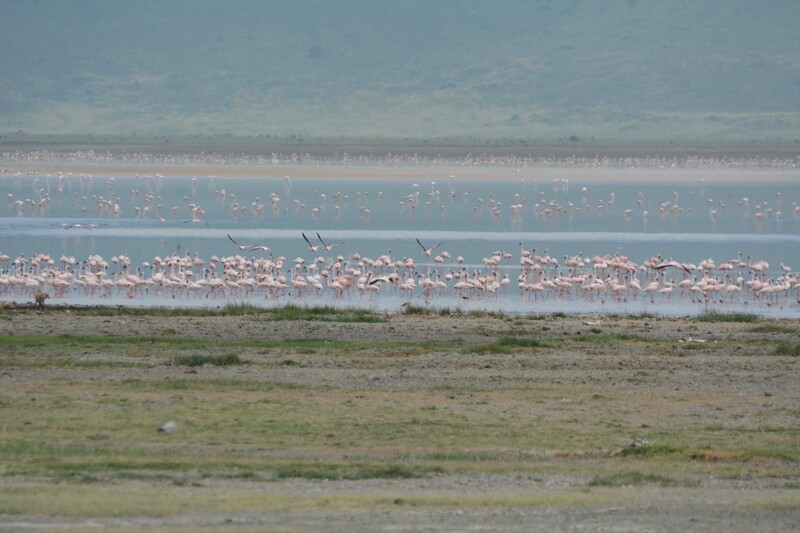 The gate entering the Ngorongoro Conservation Area from Karata is about 16 km west of Karatu on the hardtop or tarmac. Here is where the last paved road heading west across the Serengeti ends until you reach Lake Victoria. The gate is an imposing structure and opens at 6:30 am, which is the earliest that you can check into the NCA. 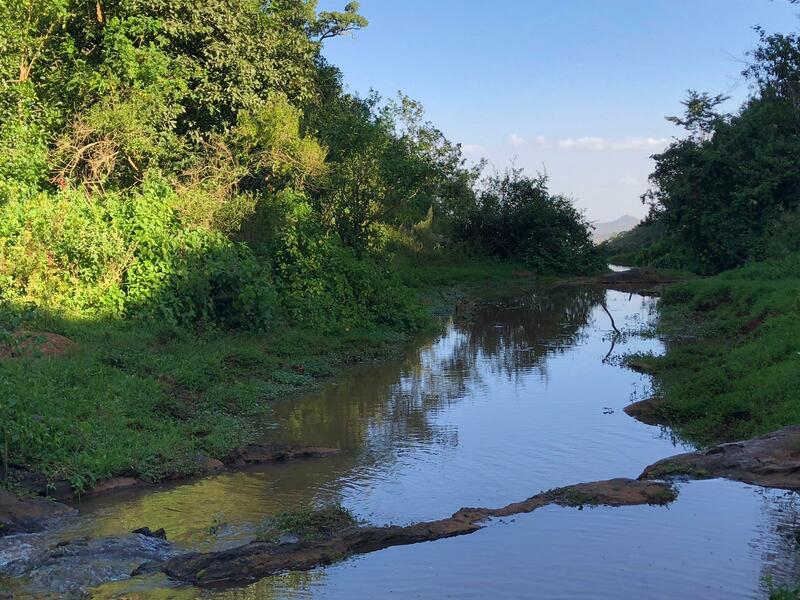 Trucks and buses traveling to Lake Victoria take the same road that we are taking, though today we will be heading into the crater and not the Serengeti. We had planned to leave at 6 am and made it pretty it on the road pretty close to that. I have had major delays in the past getting through the gate as it is heavily dependent on having all the correct paperwork and sometimes that can be a problem. I had come up to the gate several days ago just to get things taken care of and am glad that I did as everything went quite smoothly this morning. We were through the gate in probably 15 minutes or less and on our way into the NCA and eventually down into the crater. As we traveled through the gate, it reminded everyone of Jurassic Park which is actually not a bad comparison given the size of each which is quite large. 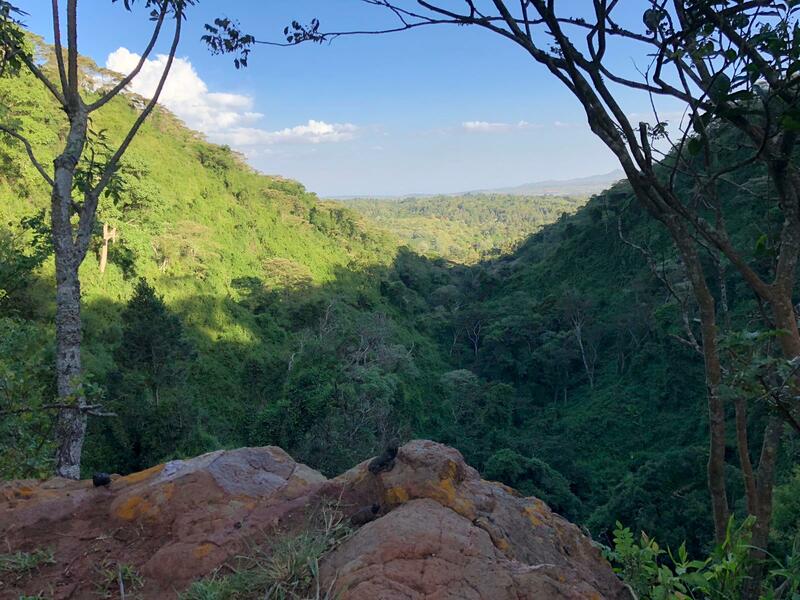 The road winds slowly up to the crater rim through what is literally a primordial forest with trees reaching to the sky from the bottom of the deep ravines or valleys that lay on one side of the road as we hug the mountainside on the other. It was an amazingly beautiful day with not a cloud in the sky and the normal clouds that sit on the crater rim early in the morning on most occasions are not present. 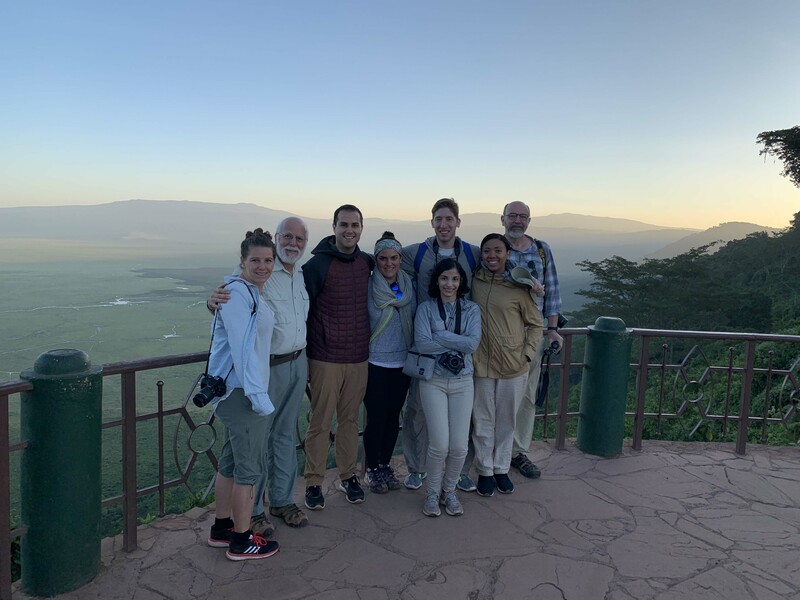 As we reach the rim, the massive expanse of the caldera exposes itself for the first time and we stand on the overlook with the most incredible view one could ever imagine. Every detail of the crater lies in front of us. In the foreground of the crater, there are tiny bodies of water or small lakes from which extend small channels in various directions that immediately remind each of us of neurons with their numerous dendrites and axons. Leave it to nerdy neurologists to make that association. It was quite cold standing on the overlook and everyone was incredibly excited to get into the crater, so we began our drive to the opposite side of the rim where we would find the one-way descent road and make our way down to the floor. 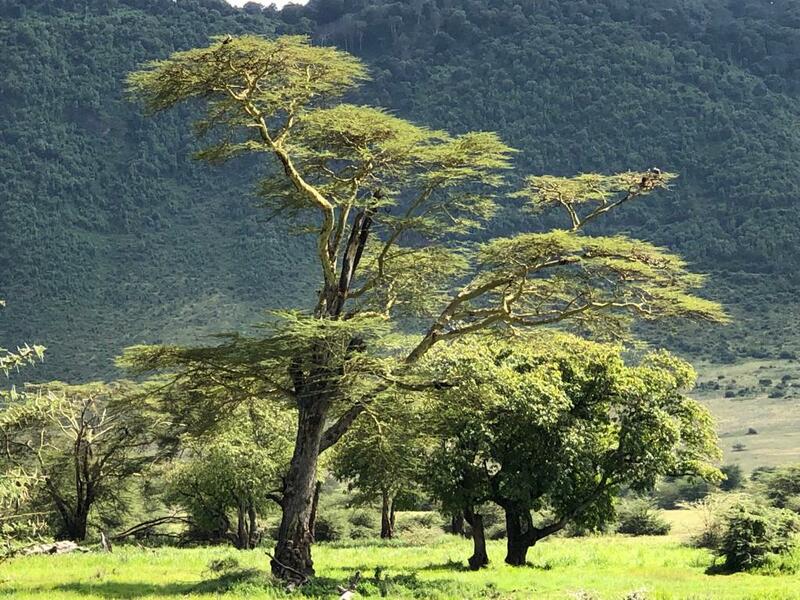 As we travel around the crater, there are constantly views to the floor at various places, as well as tremendous views of the surrounding countryside which is all the conservation area and the home to very many Maasai living in their bomas. The purpose of the conservation area is that it is multiuse. 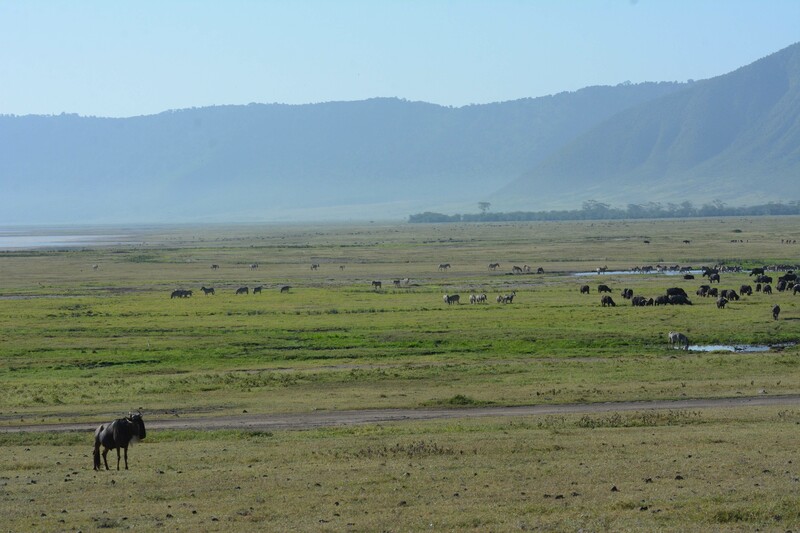 The Maasai who live here graze their cattle throughout the area, often alongside herds of zebra and wildebeest. 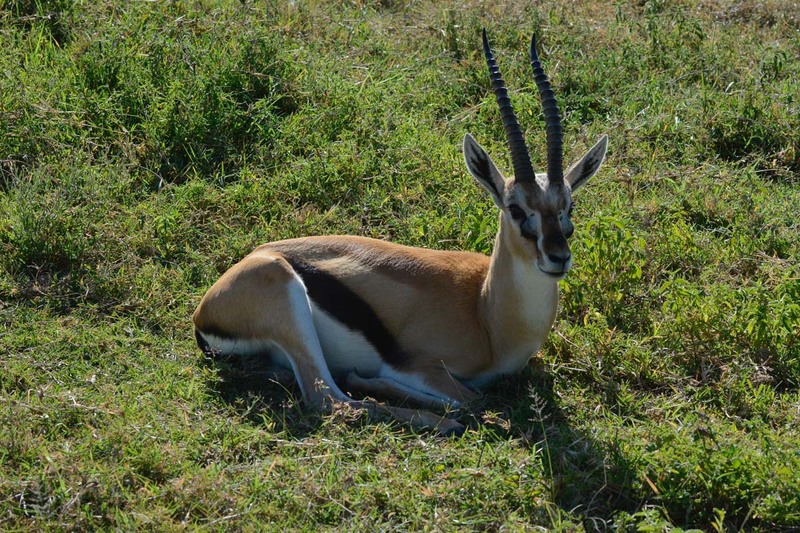 There are also Cape buffalo and elephant who trample their gardens or small plots of crops. 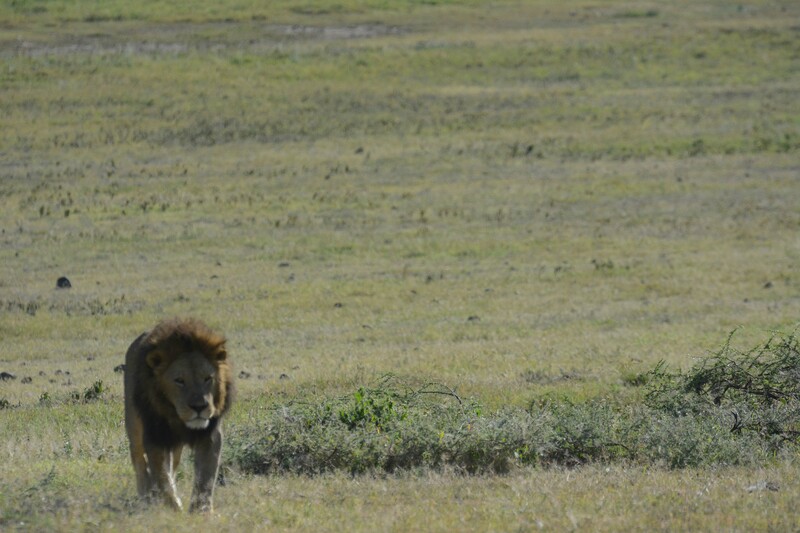 Lions will also attack their cattle at night which is why the livestock are brought into the middle of the boma at night to protect them. As we reach the southern edge of the crater rim nearing the descent road, the view south looks towards the Southern Serengeti and Olduvai Gorge stretching far into the distance. 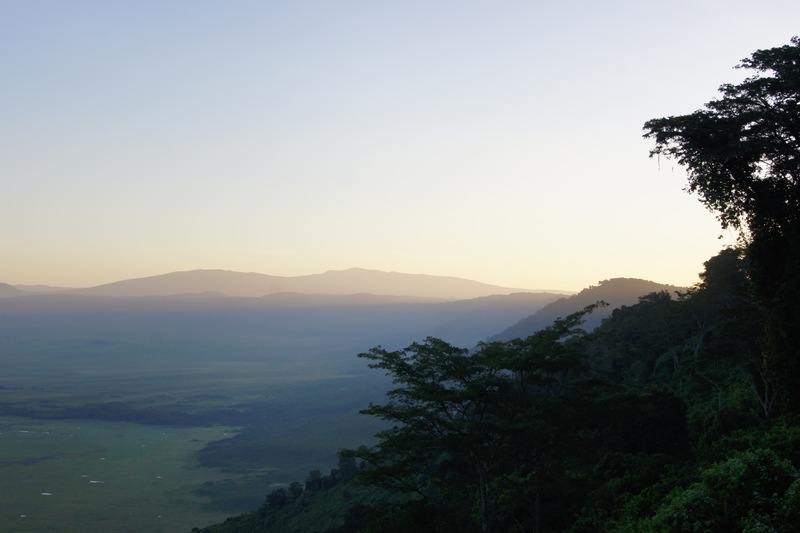 There is a valley in front of us that contains numerous bomas and is lush and green at this time of year. A shallow lake occupies the center of the valley where the herds of livestock and wildlife mingle among themselves throughout the day. We’ve finally reached the top of the descent road where we stop to check in with our paperwork. The views from this spot are equally impressive as those from the overlook so prior to loading back into the vehicle, everyone has a chance to take photos. Most importantly, we finally raise the top on Turtle so we’re in full safari mode now and it only increases the excitement that’s been building, more so given the fact that no one on board, save me, has been to the crater before so it will all be new to them. The descent road is wickedly steep, rocky, narrow, and, thankfully, one way. Leaving the Land Rover in first gear to stay off the brake is best and it is a long way down to the floor. The candelabra trees, a unique succulent here rise up alongside the roadway as we descent. We get our first good glimpse of the wildlife as we approach the bottom, but when Marin first spotted what she thought was a “dead lion,” (no worries, it was only sleeping as most lions do throughout the day) it became clear to everyone that we were going to see much more than just antelope here. 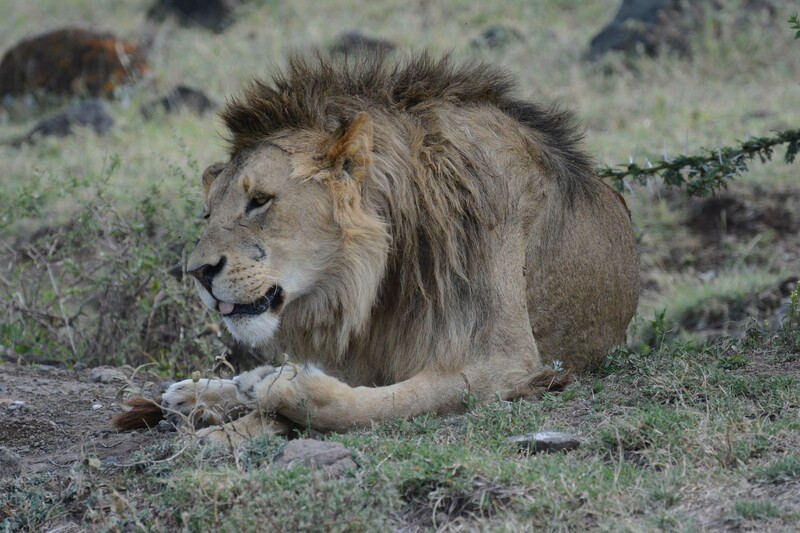 There was a total of five male lions here, two adults and three youngsters, the latter with shorter manes. 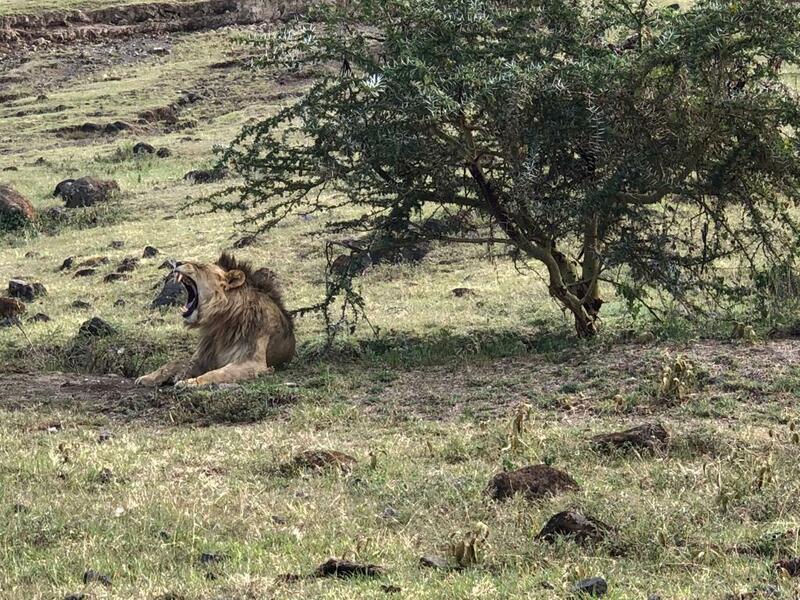 They were all sleeping, but one of the older males stood up at one point to move into the shade where he promptly plopped down alongside one of the other males. That was about as much activity as we witnessed from this group of lions today. Once down on the crater floor, your perspective of the topography completely changes as it is now a flat plain that you are sitting on surrounded completely by 2000 foot high cliffs in all directions. 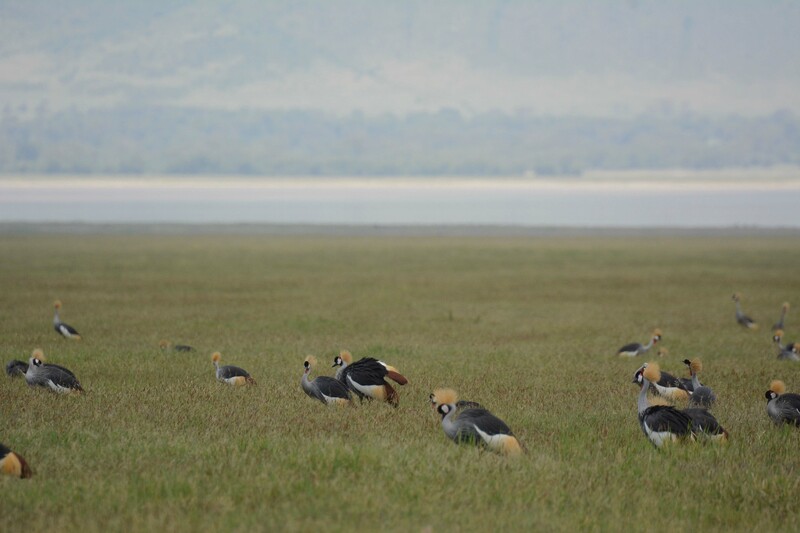 There are relatively easy landmarks by which to navigate and definite highlights such as the hippo pool, Ngoitokitok Picnic Area, the Lerai Forest, the Munge River and Lake Magadi. 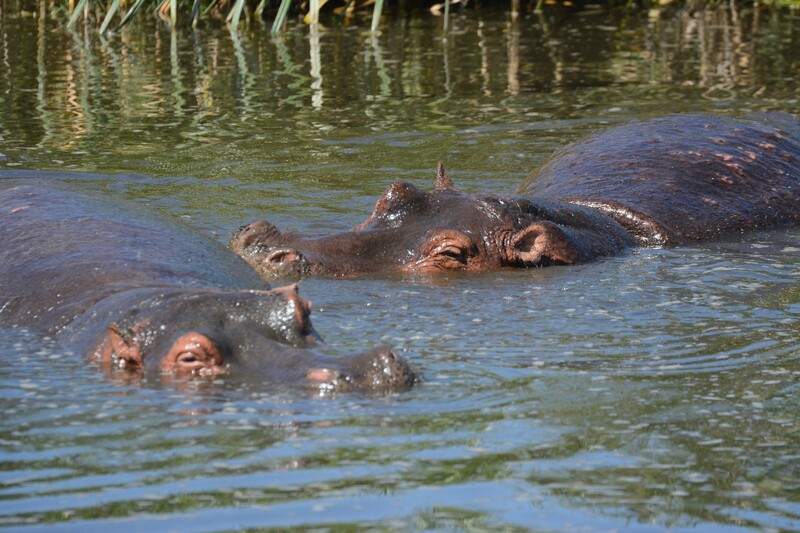 We initially drove around the periphery spotting many jackals and hyena along the way, but eventually made our way to the hippo pool where there were plenty of hippos cooling in the waters there. In the past, I’ve seen several serval cats here, but not today. 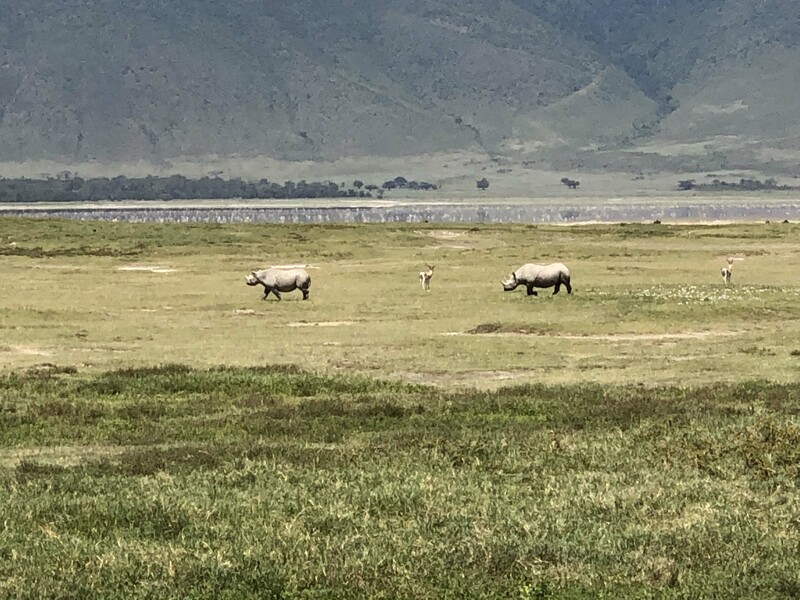 As we made our way around in the direction of the picnic area where we planned to have lunch, we spotted two large black rhinos which everyone had hoped to see today. They were a fair distance away initially, but were moving laterally from us in the direction of one of the roads that they would eventually need to cross. We waited long enough to snaps hundreds more photos, but at the right moment, I began to move the vehicle in the direction of where they were heading. 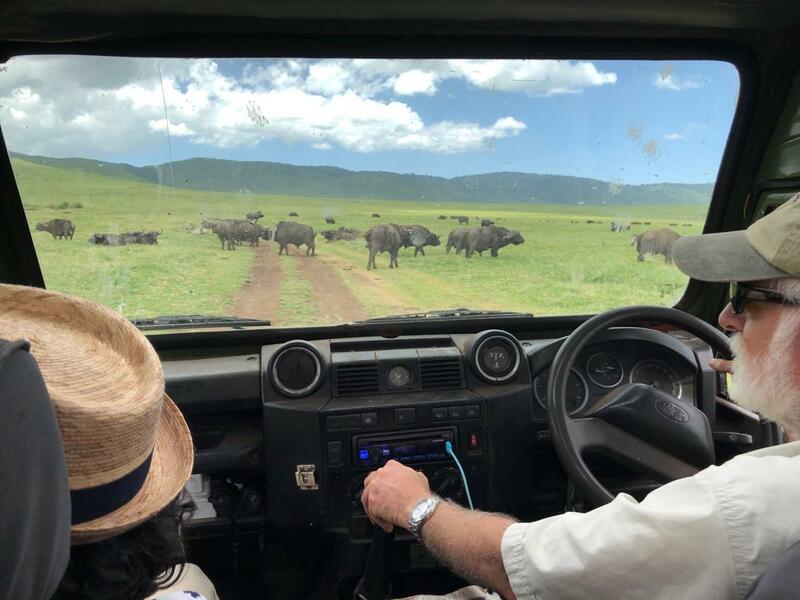 Initially, there were probably half a dozen vehicles watching the two rhino, but as word got out on the two-way radios, over a dozen cars began to accumulate at the site so I hung towards the back of the pack so as not to interfere with the animals. The rhino are very skittish which became evident as they looked as though they wanted to cross the road, but their pathway was blocked by the many vehicles so they just continued to walk parallel with the road and eventually just changed direction. 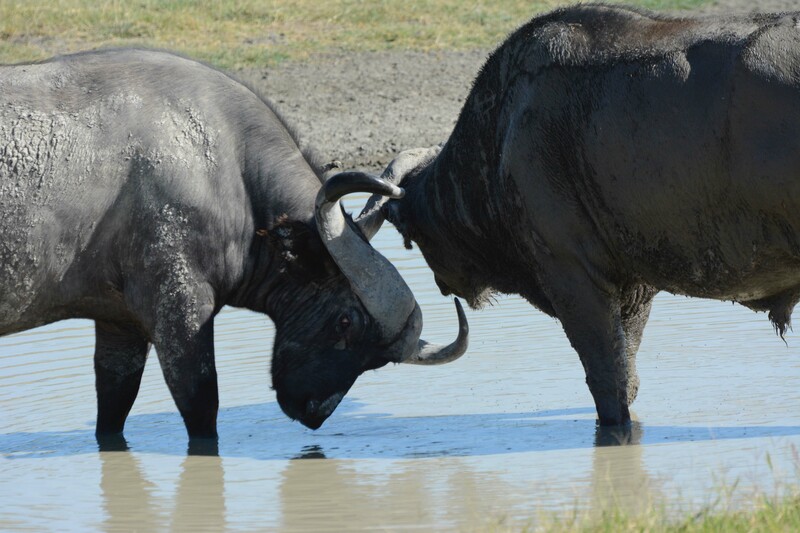 At one point, they were interacting with a small group of Cape buffalo, forcing the buffalo, a pretty feared animal in its own right, to the side with ease. The rhinos finally crossed the road in front of us, despite all the vehicles there, and made their way to a more secluded spot behind a bluff so that they couldn’t be seen as well by everyone. By this time, I think that everyone in our vehicle had had their fill of rhinos, at least for the moment, and were very interested in getting to the lunch site. The Ngoitokitok Picnic Area in the crater has to be one of the most beautiful sites in the world to sit an eat one’s lunch. Beside the fact that you’re sitting inside a massive caldera that is millions of years old with 2000 foot cliffs reaching up all around you, there is a lake with hippos floating in it and more birds than you would ever hope to count. Everyone is free to walk about here, though I have seen lions visiting this spot in the past. 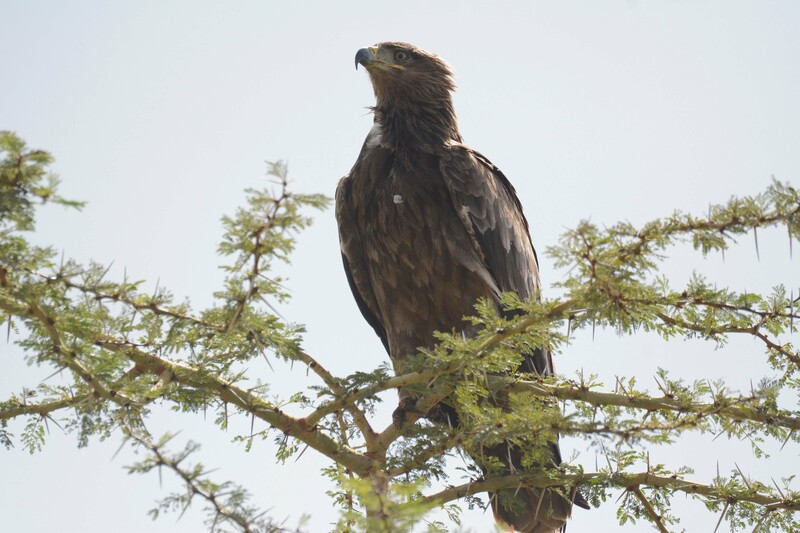 The most impressive birds here are the black kites that patrol the region from high above and have the remarkable eyesight typical for a bird of prey. They can spot a sandwich in someone’s hand from far above and then drop in a remarkable feet of acrobatics, divebombing the unsuspecting person and stealing their food just as they are about to put it into their mouth. And all of this without ever touching their victim and without any warning whatsoever. Since my first visit here, I was taught about the kites and the need to stay in your vehicle to eat or else suffer the consequences. There is usually one group who have either decided to disobey their guide or their guide had decided in advance not to tell them. Who knows? But for those of us watching, it can be a pretty crazy show and well worth the cost of admission. 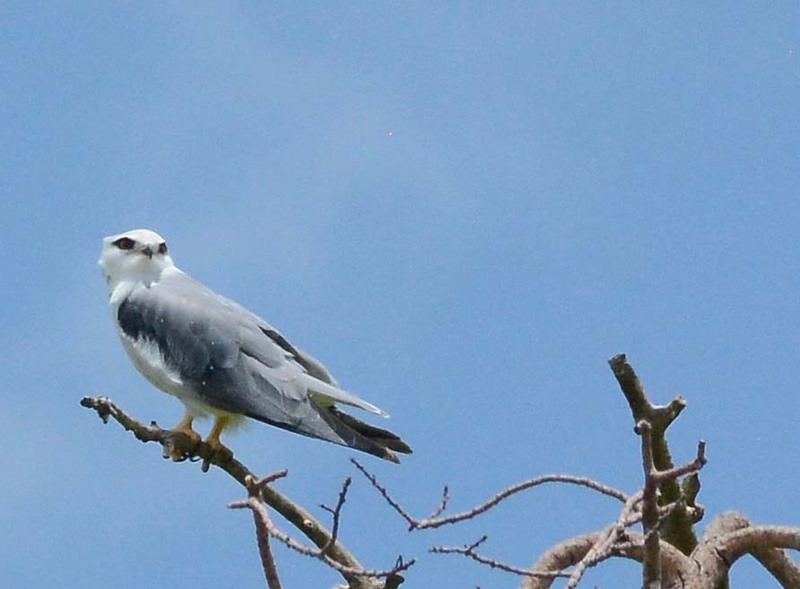 We did keep an eye on the kites throughout lunch as they were checking out every vehicle that had stopped for a meal. There are lots of weaver birds circulating here as well, and they’re brave enough to come into our vehicle, but do far less damage than a giant kite would do with its enormous wingspan. 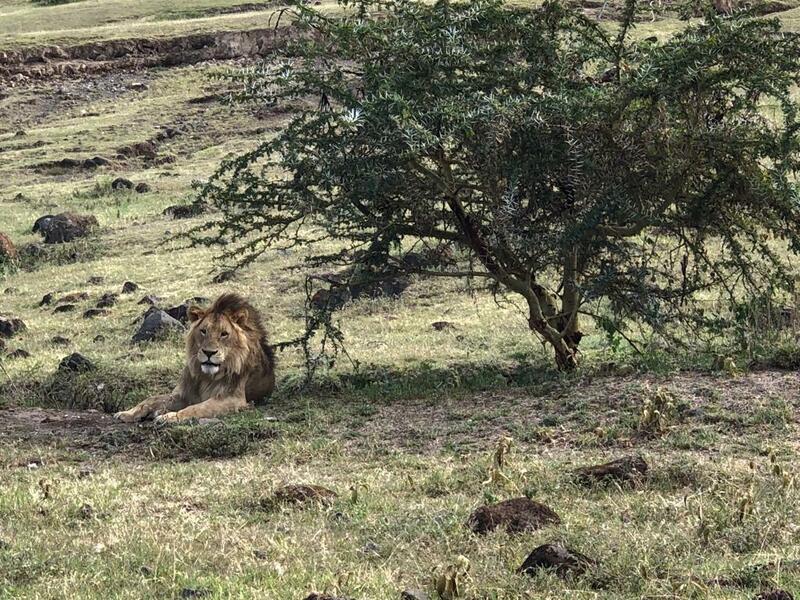 While on the crater rim having lunch one time, I hadn’t thought that the kites were there, but one located my piece of chicken that was inches from my mouth and promptly swooped in to grab it without having even grazed me in the process. That was a bit startling, to say the least, and had quickly gotten the attention of not only me, but also everyone else sitting in our little circle. As we left the picnic area we decided to head towards the Munge River area looking for any cats, but unfortunately, did not see any today. Driving along the river, we did run onto large groups of Cape buffalo, who always look a little bit disturbed by our intrusion, to the degree that at times they look as they would love to charge the vehicle, but thankfully haven’t. We drove along the opposite side of the river for a long way, ending up sitting on the top of a large hill that has a great vantage point to see the entire crater floor. There had been clouds gathering and small ran showers in local areas that forced us to close the tops on the Land Rover on one occasion, but only temporarily. It was getting late and we had planned to pick up Kitashu at the junction of the road to Endulen around 4:30 pm. Driving up the one-way, paved ascent road, winding up and up on continuous switchbacks, there are constant vistas of the crater, each one more beautiful than the next. A short backtrack to the junction and we met Kistashu, who piled into the vehicle and we were off on our way back home to Karatu. You must check out of the NCA by 6:30 pm, which is when the gate is locked and, without an official document, you end up having to spend the night there which can be a bit of an issue without having first arranged some form of accommodations. Sleeping in your vehicle can be a bit of a struggle while sleeping on the ground outside can be just a bit too dangerous. We made it to the gate with plenty of time to spare, unlike a few times in the past, checked in with the rangers and we were shortly on our way having had a wonderful day we had in the crater, one that everyone would certainly remember for years to come, and headed off to Karatu and Happy Day pub for dinner. Saturday, March 16 – A wellness day at Gibb’s Farm and the Elephant Caves…. We arrived Saturday morning for report and met with Dr. Anne to hear about how the patients had done overnight. Of course, we were all waiting to find out how our stroke patient from the day before had fared as we had placed her on palliative care and the expectation was that she wouldn’t last the night…hopefully. Anne reported that her breathing had become very shallow and that she remained unresponsive to any verbal stimuli. Again, there was absolutely no question by any of the care team as to what we were dealing with (an intracranial hemorrhage and increased intracranial pressure) and what the outcome of the case was going to be (that she would be left totally dependent on others with severe neurological deficits if she were to survive). Following report, several of us went into the ward to check on her and, as if having been waiting for our permission, she became apneic and shortly thereafter expired. 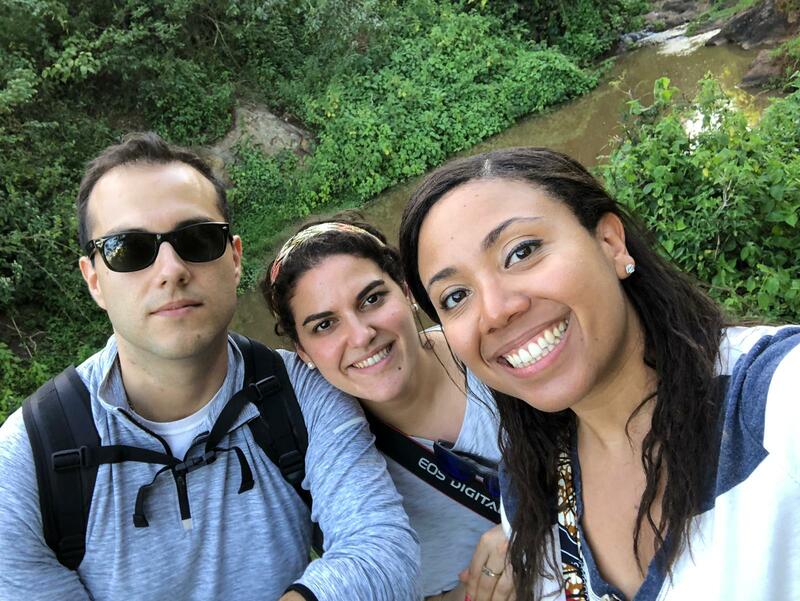 Following her death, Daniel found that perhaps the most positive outcome from the entire process was when the patient’s sister asked him to check her blood pressure to make sure that didn’t also have hypertension. The little child with the thrombocytopenia and anemia who we had kept at FAME to see if their platelets would respond to steroids, was doing well, but their platelets came back that morning at only 4 thousand, down from 5, but it wasn’t entirely clear that the therapy had kicked in yet or not. Both Marin and Dan were incredibly helpful as pediatricians on this case as I would have had no idea of what to recommend in this situation. The plan ultimately was to keep the child over the weekend, continuing the steroids and then rechecking counts on Monday morning. If the platelet count continued to remain low, then the plan was to send the patient to KCMC for a bony marrow aspirate which was the next procedure to be done. Dr. Jackie had already them about the possibility and there was no reason to send the child over the weekend as they wouldn’t be able to do the aspirate until Monday, regardless, and their specialist, who could evaluate the child, would also be there on Monday. 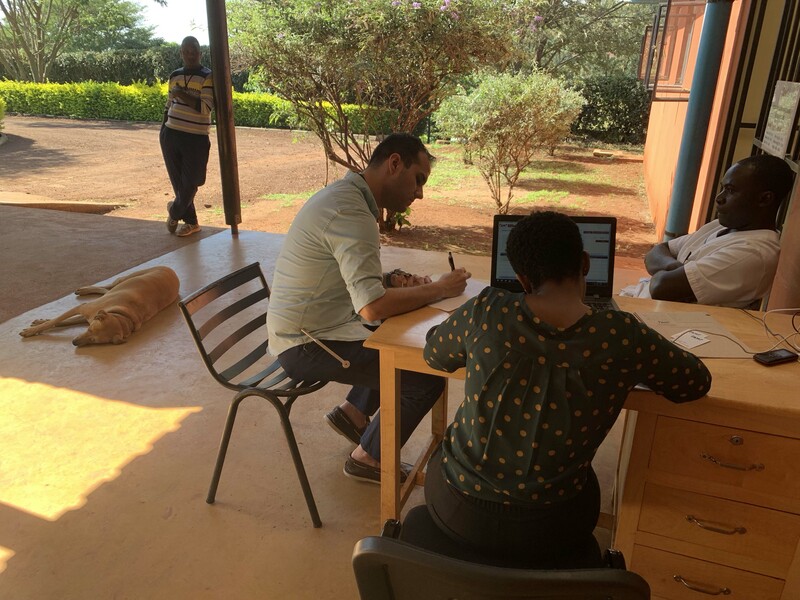 Our plan for the day was to work the morning and see as many patients as possible with the idea that we would try to finish at around noontime. 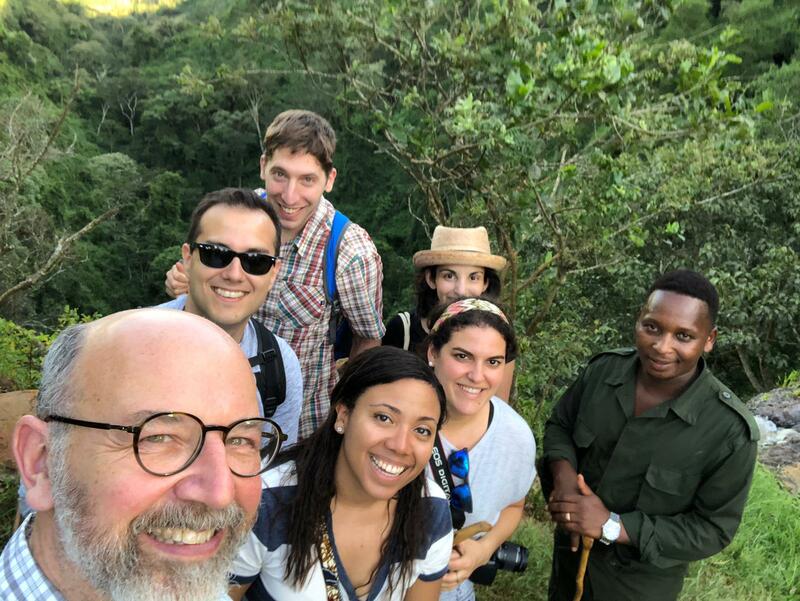 I had made reservations for the seven of us to enjoy the wonderful lunch buffet at Gibb’s Farm and every one was going to climb to the elephant caves that are a short hike from Gibb’s up the Ngorongoro Conservation Area, or NCA. As is usually the case, we had packed everything up and were ready to head to the house and go for lunch when a young girl arrived who had been struck by a piki piki. At the time, she had apparently been knocked to the ground, struck her head and was unconscious for two hours. She had also developed some bloody discharge from one of her ears that had stopped and now had classic post concussive symptoms that included headaches, dizziness, and tinnitus. She had been referred to us for evaluation and a CT scan. Jon took a thorough history and performed a neurologically examination that was normal including a look in her ear that revealed some dried blood in the canal, but the tympanic membrane looked just fine. Our CT scanner was not yet up, but we didn’t feel that she needed a scan regardless, and so treated her conservatively. 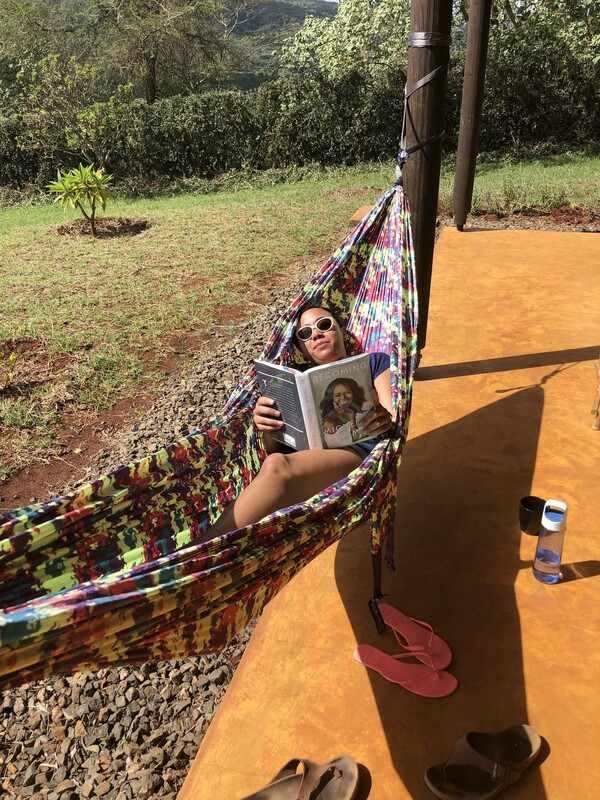 Given that she was from the village of Oldeani, nearby the Rift Valley Children’s Village where we’d be next week, we just asked her to come see us there to make certain she was still doing well. We were finally off to Gibb’s Farm for our lunch and it was an absolutely gorgeous day for us. 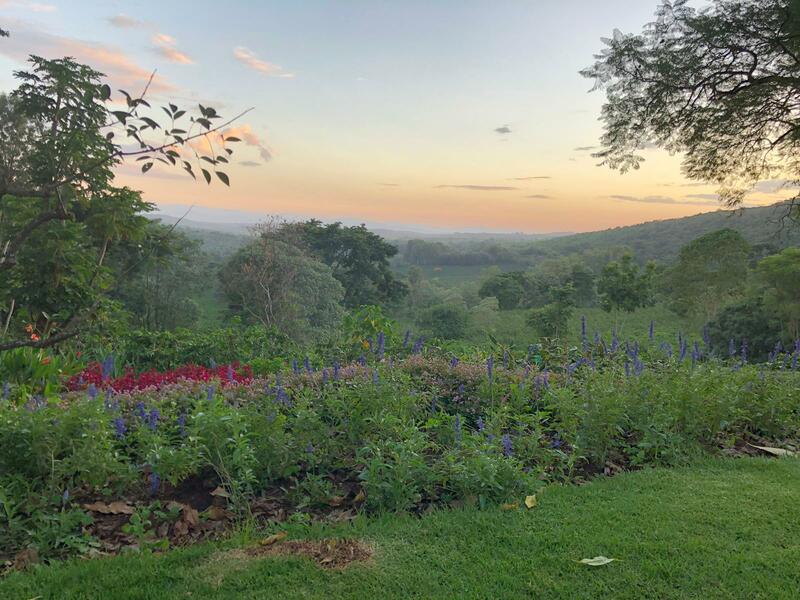 They had reserved a table for us on the veranda overlooking the coffee plantations and with a view to the distant mountain ranges of the Lake Eyasi region many hours away. Lunch here is also an event, very similar to the dinners, but in a much more relaxed and informal manner. They have dozens of selections of local and ethnic cuisine that have all be prepared to perfection by the wonderful kitchen staff. Their cheeses are made on site and all of the produce is grown there at the farm. The dessert selection is also an amazing affair with numerous selections including fresh fruit. 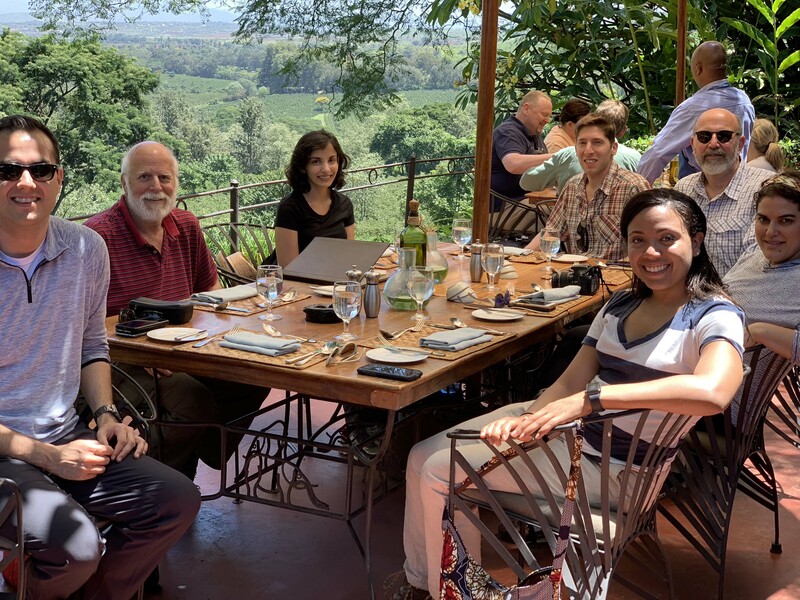 We all sat at our table in one of the most beautiful locations of the world enjoying some most wonderful dishes that one can imagine. When lunch was finally over and everyone had had their fill (and then some), it was time to head to the trailhead for the elephant caves. 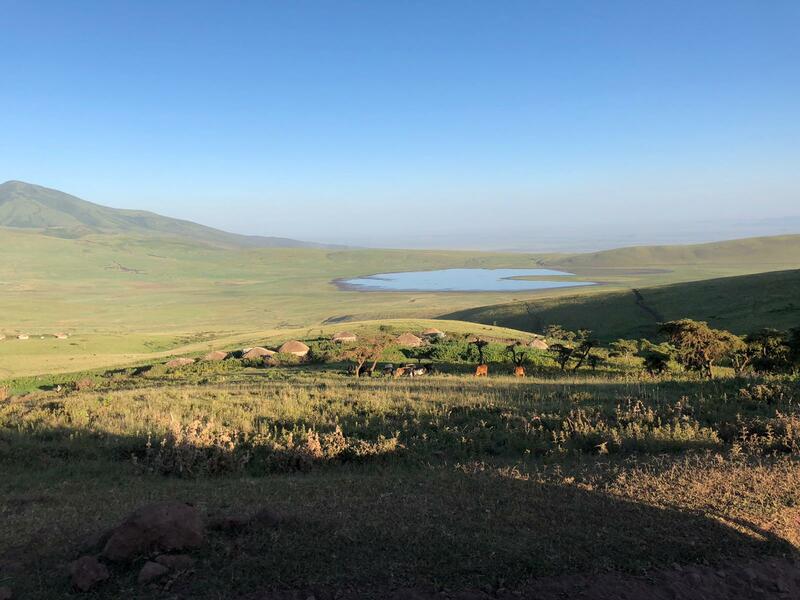 Since this hike takes you into the Ngorongoro Conservation Area (read, wild animals), you have to first check in at the ranger station and hire a guard. The cost is $18 per person for the walk and well worth the experience. 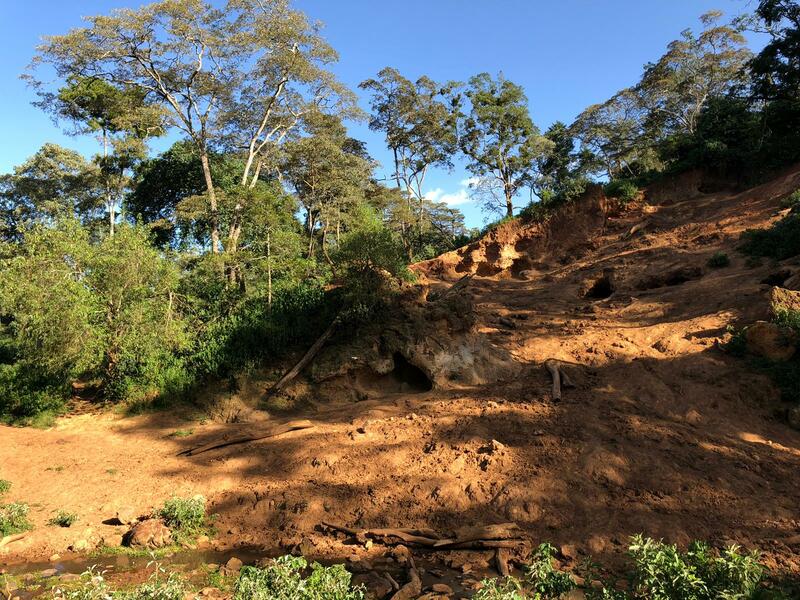 The “caves” are really impressions in the hillside where the elephants come to dig out minerals from the soil that they need for their nutrition. You can see elephants there on occasion, but for the most part, the elephants come there at night so you don’t run into them. 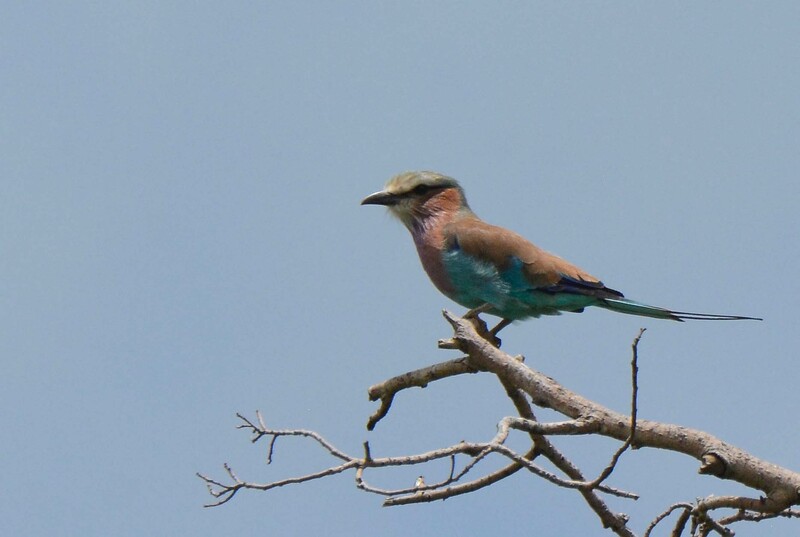 You other animals on the hike, though, such as the ubiquitous baboon and lots of birds. There is a very nice waterfall on the hike as well that you can walk up to the edge of and is quite a drop. Since I had been on this walk several times before, I decided to drive them the short distance to the gate and then head back to Gibb’s where I could spend the entire rest of the afternoon waiting for them to return from their hike all the while sipping on a Moscow Mule. Even better yet, I am well-known to the staff aft Gibb’s Farm as either they, their spouses or children come to see us for their neurological care, so they take very good care of me. It is almost too relaxing sitting there on the lawn in the shade to do reading or work, so I am certain that there were a few short naps interspersed with my blogging of the day early. Gibb’s Farm has to be one of the most unique places in the world and being able to come back here time and time again is truly special. Even more special, though, is bringing the residents and others who accompany me to this place of beauty to experience it for their first time and see their reactions. The trip to the elephant caves lasted until the evening and it was quite close to sunset with the others arrived back to meet me, still sitting in my same chair and typing away. I had promised them come nice cold drinks on their return and most everyone decided to enjoy the sunset with some refreshments. Everyone had also wanted to speak with the artists, one of who I had purchased several things from over the years. It was quite late by the time we ventured back to Turtle to begin our journey home to FAME. 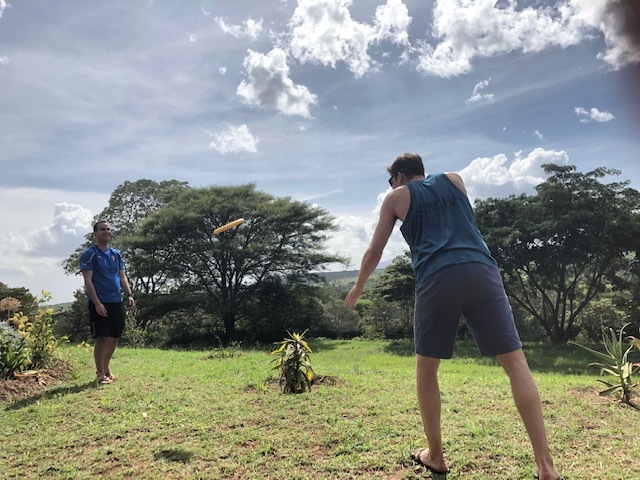 We had plans to head to Ngorongoro Crater the next morning, leaving at 6 am, and still needed to make our lunches for the game drive, so there was much to be done to prepare for the day. Jon, Daniel, Adys and Sheena have become real pros in making all of this happen and once again we had everything made and packed up in short order and now it was just a matter of getting to bed with thoughts of the crater on our minds as we slept and the vivid Malarone dreams assisting in the whole process. Friday, March 15 – A very sad case of a stroke…. Having had just a wonderful night with Daniel Tewa and his family, we were now ready for the end of the week. 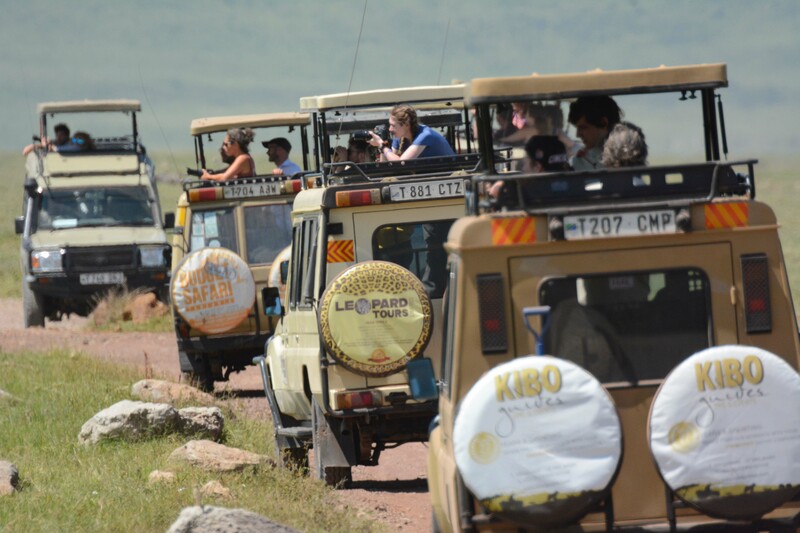 Our Saturday would be a half day of patients with a “Wellness Day” for the afternoon and then on Sunday, we had plans for a day game drive to Ngorongoro Crater, one of the premier game viewing sites in all of Africa. Since it will be March 17 the day we’re in the Crater and Phoebe, who is Irish, is coming with us, we will be bringing some beer along with us to celebrate at lunchtime. 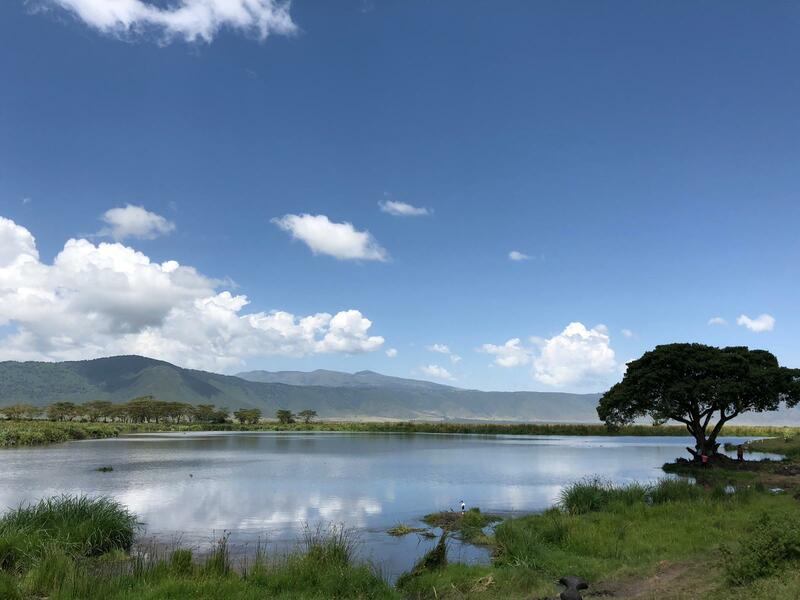 I will do my best to post the Ngorongoro Crater blog on Sunday night depending on how exhausted I am after driving and guiding all day. 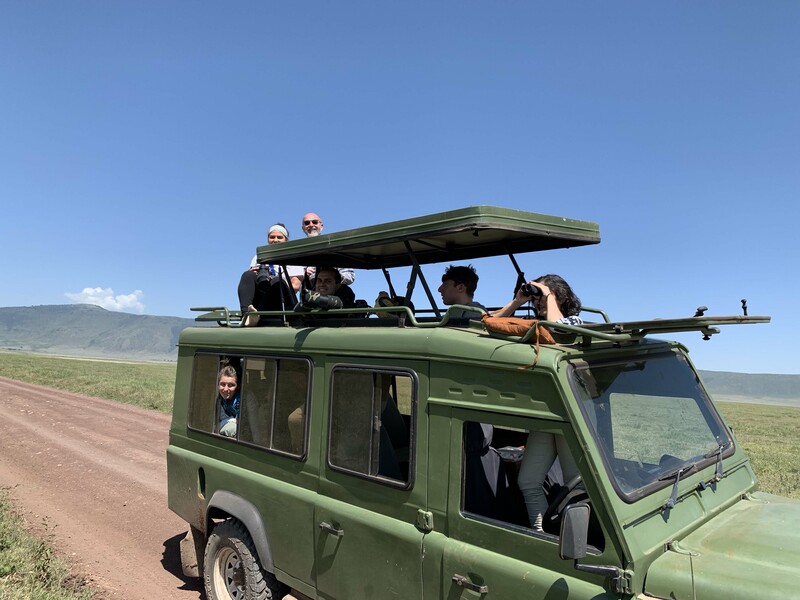 I was recently asked what my favorite thing to do here was, and I would have to say very honestly that it is taking people on safari and driving myself. I can easily remember how I felt when I first came here seeing the remarkable sights and visiting with these amazing people here. My greatest love is to introduce others to this wonderful country. At morning report, we ran through all of the patients in the ward, several of who were our pre-eclampsia/eclampsia women who, thankfully, were all doing well though needed some stricter blood pressure control as we were afraid that their PRES could easily return and they had been doing so well. Sheena’s patient who had been billed as a post-partum psychosis, but had no psychiatric history and seemed to respond well to blood pressure management and levetiracetam. She improved by the following morning, having gone from being completely uncooperative and constantly singing to being fully alert and cooperative. There seems to be a very significant incidence here of pre-eclampsia/eclampsia and it is not entirely clear why that is other than perhaps the much higher incidence of hypertension, even in young women. 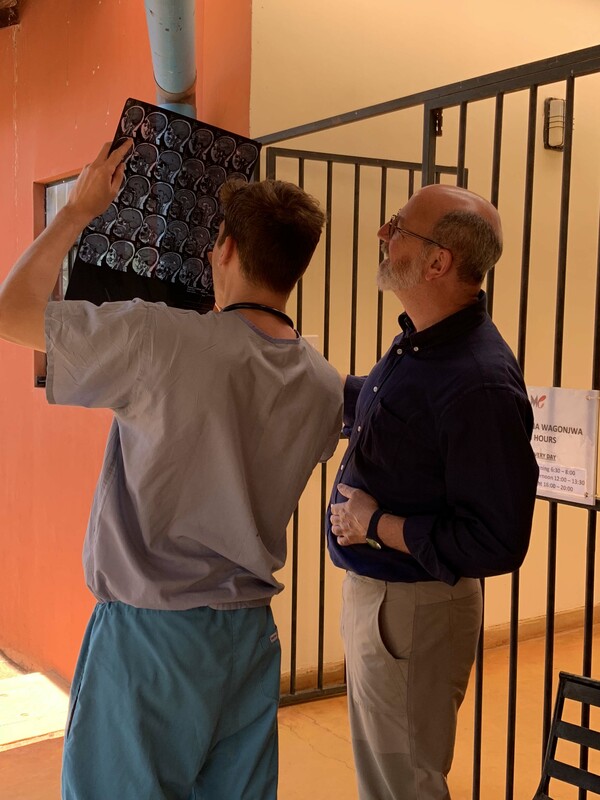 At the end of morning report, we were also able to pull up the X-ray of the young baby who had died last weekend so that Dan could review it in light of the initial concerns of some congenital heart issue. He felt that the X-ray was very abnormal and definitely suggestive of this. The baby had been initially fine, but then cried out several times, each time associated with desaturation of oxygen and turning a bit cyanotic. On the third cry, the baby died and they were unable to resuscitate it. The CXR had been done prior to all of that occurring and had a very large heart and wide mediastinum. Dan concurred that the baby most likely suffered from one of the congenital development cardiac issues such as transposition of the great vessels and that is not something that can dealt with here by any means. A baby had come in the day before and was presented today at report with severe anemia and thrombocytopenia who had been seen here last October with similar problems and had responded to steroids with the platelet count increasing from 5K to 85K the following day. It was unclear how much of a workup had been done at that time, but the baby hadn’t been seen in the interim so it was presumed that they were doing at least reasonably well. They now had a hemoglobin of 5 and platelets of 5K on admission. Given the fact that he hadn’t returned in the six months, that would make leukemia very, very unlikely, but an autoimmune thrombocytopenia was a possibility, but wouldn’t explain the anemia, so that would have to be from another process. After much discussion, the child was placed on IV steroids to see it he would respond again and will be monitored going forward. Just before noontime, we were urgently requested to come to the OPD to see a patient who had been brought in with an apparent stroke. Daniel accompanied Dr. Julius back to the OPD to see the patient and returned a few minutes later to report that she was a younger woman (51-years-old) who was not moving her right side, was not responsive and had systolic blood pressures over 200 mmHg. She was being moved over the emergency bay so that we could care for her more appropriate. When she arrived here, she was already posturing her right side, her pupils were sluggishly reactive, and, most concerning, she was dropping her heart rate in the setting of severe hypertension with systolic pressures still well over 200, which is known as a Cushing’s response and occurs in the setting of high intracranial pressure and impending herniation of the brain. Unfortunately, her symptoms had begun the day prior when she was shopping and developed right-sided weakness and aphasia. At some point, the family had taken her to a dispensary and she had been referred to come to FAME for a CT scan. Our CT scan has been down since last October due to the various problems, but was ready for operation once it was approved by the Tanzanian Atomic Energy Commission, which we were waiting for and had not yet happened. What ensued at that point was a very practical discussion of what should be done. Given her presentation, we were reasonably confident that we were dealing with a hemorrhage large enough to have caused her to begin to herniate. 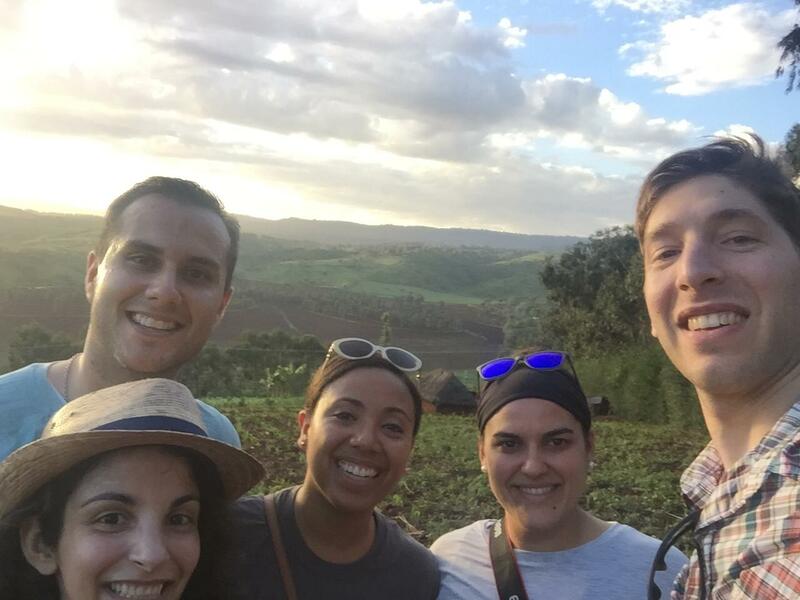 If we were to send her off to Arusha for a CT scan that would cost $200, it was very unlikely that there would be any intervention that could be performed. Even if some intervention could be performed, it could only be expected to possibly save her life, but to what purpose we were very confident that she would never be able to move her right side or speak and would be totally dependent on others for the rest of her life quite possibly with complete lack of awareness. We did discuss the situation with her family at length to explain to them the dire nature that she was in and that regardless of what we did, it was most likely that she was going to die and that the very best we could hope for in this situation was to save her life, but that she would be dependent on others for the rest of her life. We were limited in what to treat her with here as our IV antihypertensives are minimal and we were hoping that the family would agree with our plans to initiate palliative care. Anything that we did now would only prolong the inevitable. 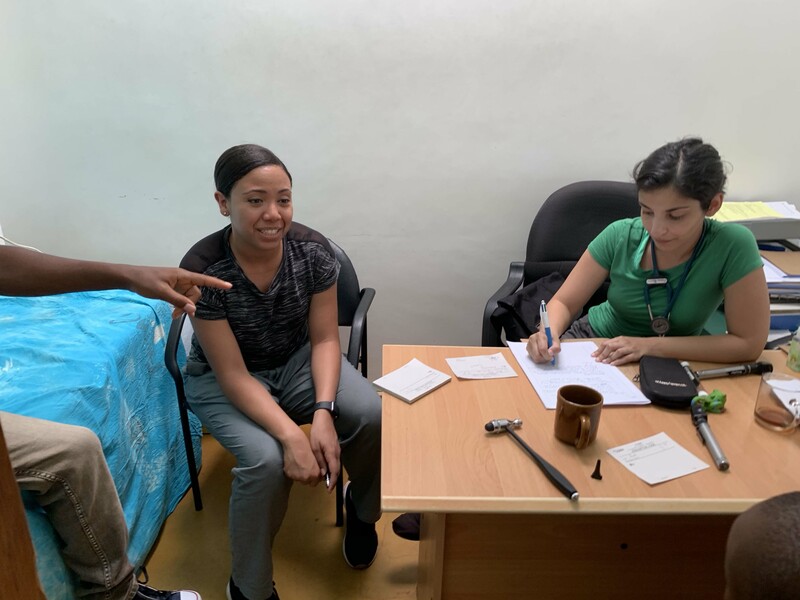 The family insisted in contacting her parents even though her husband and other family were here and, thankfully, after everyone was contacted, there was a very reasonable understanding on their part so that she was moved to the ward and placed on comfort care only. She was given a small amount of morphine to decrease any agitation she might have as a result of her oxygen hunger and she was made comfortable, waiting for the end to come. Considering the circumstances, it was clearly the right thing to do, but regardless, it was tough for everyone considering her age and the fact that this very likely something that was preventable had she only been compliant on antihypertensive medications. Hemorrhagic stroke is much more prevalent here in Africa than it is elsewhere solely because of the higher incidence of hypertension in general, and untreated hypertension specifically. We spent the evening at home, relaxing, and thinking of what we were going to have for dinner. We received our “bacon, no lettuce, and tomato” sandwiches on homemade bread, but I had been dreaming of making a bacon and tomato egg scramble with the ingredients after deconstructing the sandwiches. Jon was all in for the scramble as well so I whipped up some eggs and Adys joined us as well. We had borrowed a small, compact LCD projector that Phoebe had and watched the Lion King on the wall. I listened to most of it while cooking and typing, but it hasn’t changed. It’s a classic and everyone’s now exited to go find Pride Rock while we’re on safari. After Lion King we watched a very good climbing movie that Marin had on her computer called Free Solo about free climber Alex Honnold. For those of you who love extreme outdoor movies, it is an amazing documentary about an incredibly select group of climbers who do not use ropes and place their life at risk every moment on the mountain. It is also an excellent documentary from the perspective of what kind of person it takes to succeed in such an endeavor and the psychopathology (I’m using that word in a purely clinical perspective and not at all judgmental) that is necessary. 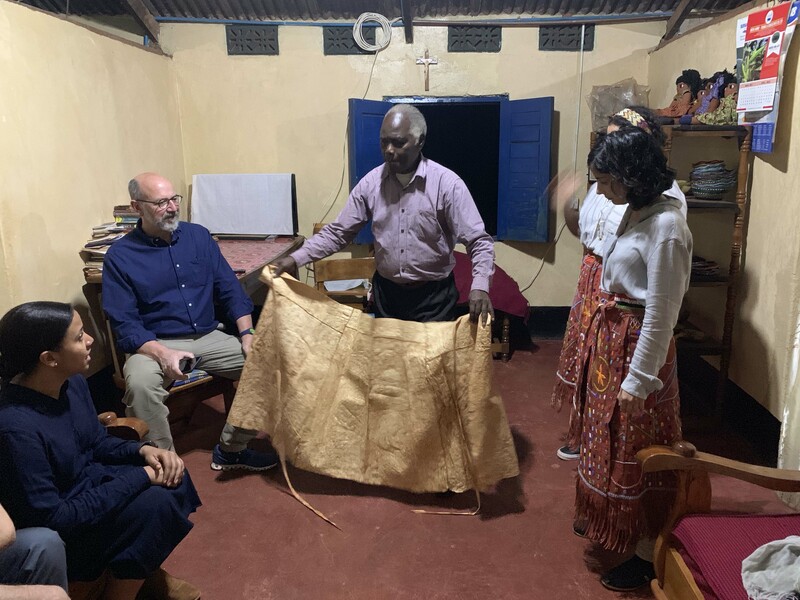 Thursday, March 14 – A visit with Daniel Tewa…. For those of you who have read yesterday’s blog, there is no need for me to introduce Dr. Vic Davis. 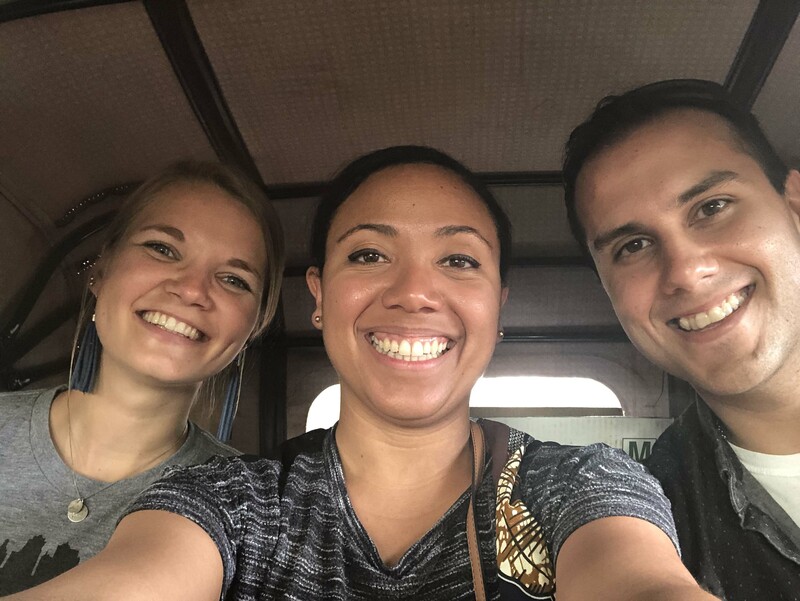 If you’re new to the blog, Vic is a trauma surgeon who has tremendous experience all over the world in war-torn torn areas and just happens to be here visiting FAME and Dr. Kelly on a short break from a stint in Dar es Salaam at Muhimbili University. Vic had offered to speak this morning for the education session on the management of burn wounds. Not something that we necessarily encounter on a daily basis in neurology, but something that is definitely worth relearning given the area that we’re in and the fact that we could certainly be asked to assist in managing these patients if the need arose. Vic had first completely filled out the white board with the points that he wanted to cover in his talk and did a wonderful job of getting to everything in the short time he had allotted this morning. It was again a complete pleasure to hear him speak from a place of absolute confidence and experience in the subject. 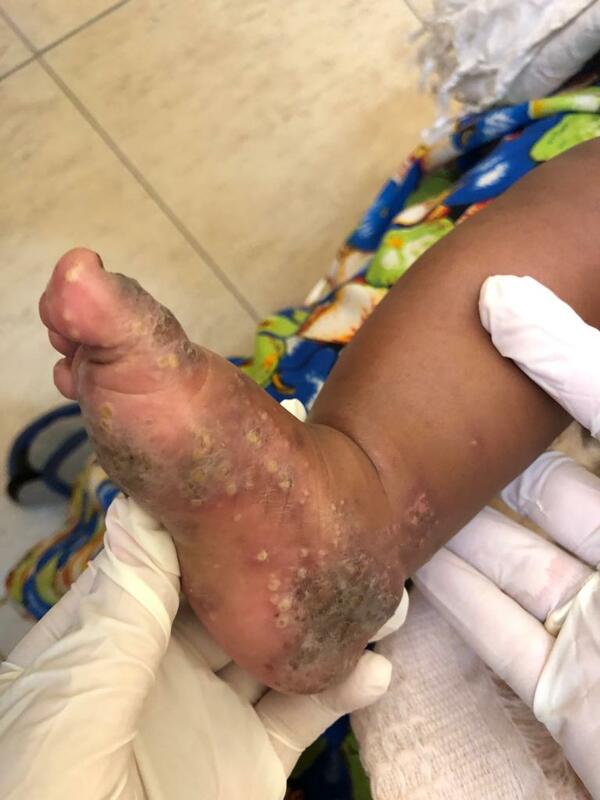 One of the more puzzling cases of the day didn’t involve anything neurologic, but it was a young 9-month-old child with a severe rash that had been seen previously at FAME and treated with topical steroids and antibiotics with continued worsening. It had been present for about six months and looked horrible. Both Dan and Marin (our pediatric peeps) were asked to take a look and weigh in with their thoughts. We did have some ideas, but in the end sent off photos to several resources in Philadelphia. I emailed the photos to Carrie Kovarik, who is at Penn and an expert in dermatology, dermatopathology and tropical medicine. Dan and Marin not only emailed the photos to their Jim Treat at CHOP, but also called (with the time difference, I think it was like 6 am!) to see if they could get additional information. 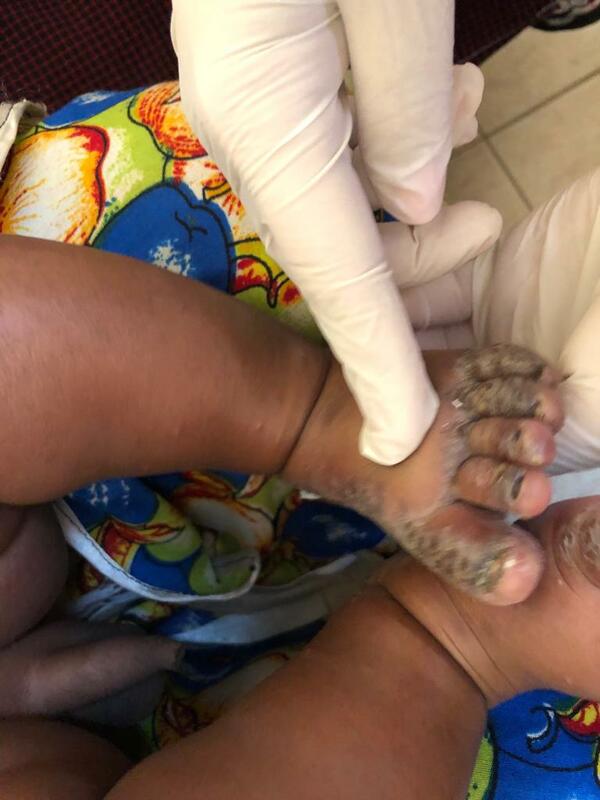 The feedback we received suggested that this was “unusual/ fulminant acropustulosis of infancy,” that usually occurs on the hand and feet, but can also affect the face, nose and ears and can often be mistaken for scabies when it involves primarily the feet (trust me, all of this was from Carrie as this is not my shtick by any stretch). It should respond to high potency steroids and will often burn itself out over time. 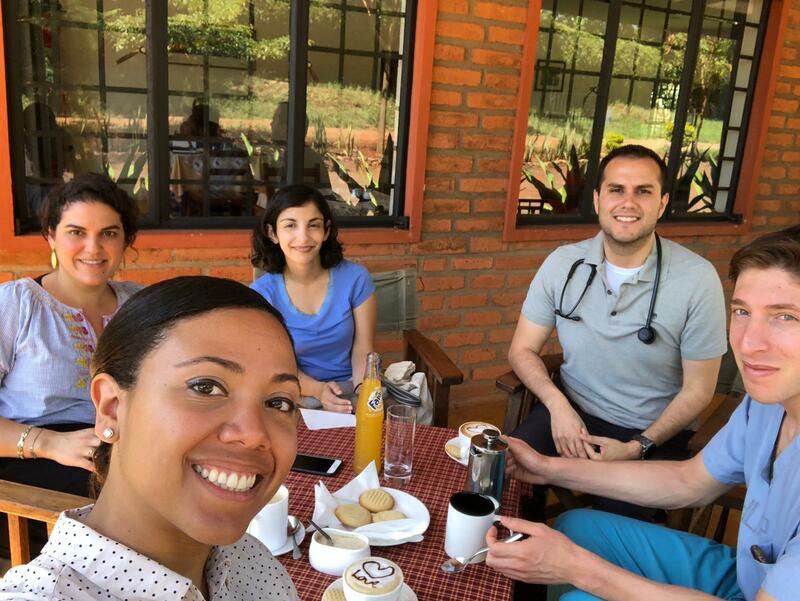 We continued to see patients throughout the day, but having Dan here to not only staff the pediatric cases but also some of the adult cases, it has allowed me the freedom to spend some time at the Lilac Café this trip and that has been a real luxury for me. In the past, I’ve had Danielle Becker with me, though on one of those trips, she was focusing primarily on the epilepsy cases. Dan has adapted incredibly well to the style of practice here which is a real compliment given the unique nature of practicing medicine in East Africa and it has been wonderful to have him here working with us, and not just because of the freedom to take my Lilac Café forays. The Lilac Café was created when the new hospital opened several years ago as it became clear that there was a need to feed the inpatients and their families beyond what the FAME cantina could handle. 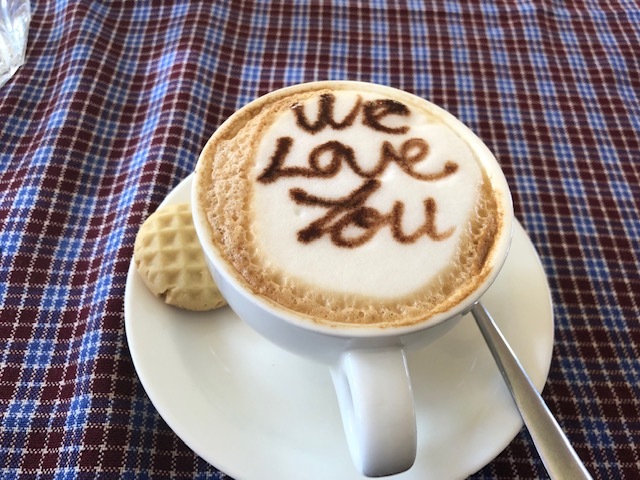 It is a lovely place for us to meet and have coffee in the morning when things are slow and, today, I took the opportunity to spend some time here outside on the porch with a wonderful cappuccino. Susan and Frank also happened to be here at the same time discussing logistics for their upcoming fundraising trip in the US. 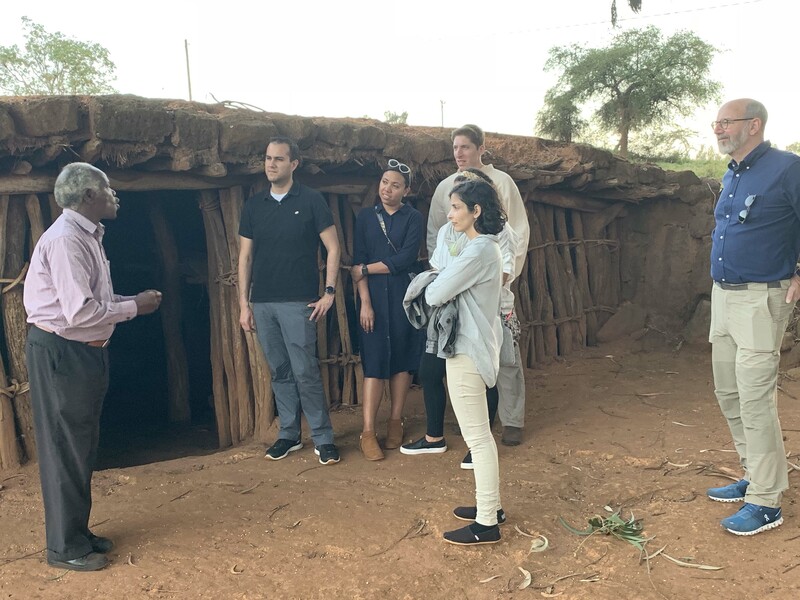 I took the liberty of introducing them to the concept of AirBNB, something they have not tried in the past and something that I have been using extensively over the last several years. Two years ago, I spent a week in the Galapagos Islands in the town of Puerto Ayora on the Island of Santa Cruz, so it is clearly possible to find something just about anywhere in the world. For those of you who haven’t looked into it, I would strongly suggest giving it a try. I continued to enjoy the warm rays of the sun sitting out on the porch enjoying my cappuccino and remembering just how incredibly lucky I am to have this opportunity to come to FAME and share this experience with others. We had arranged to visit Daniel Tewa and his family tonight for dinner. 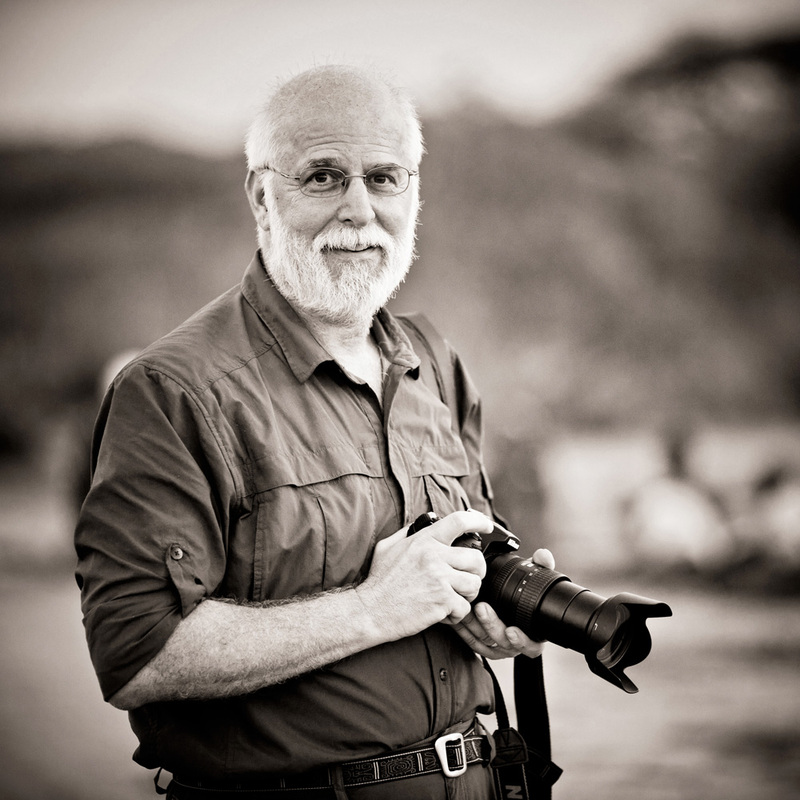 As many of you know, I first met Daniel when I came to Tanzania with my children in 2009, and have visited with he and his family on every trip back to FAME since that time. 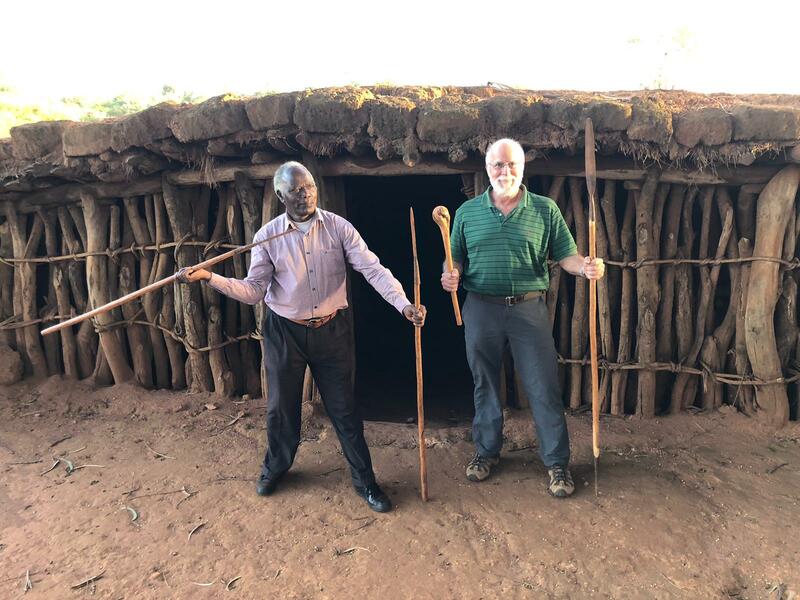 Daniel is a remarkable man who is a self-taught historian of not only Tanzania, but also of the world and is far more knowledgeable about our own country than most Americans are by far. And though Daniel and I have become family over the years, it is really that fact that he has opened his home to those residents and others who have accompanied me on our visits without hesitating and has continually insisted that the honor is his and that he would not have it any other way. What began as simple visits by myself have now morphed into his entertaining our entire group for the evening which this time added up to seven of us including myself. 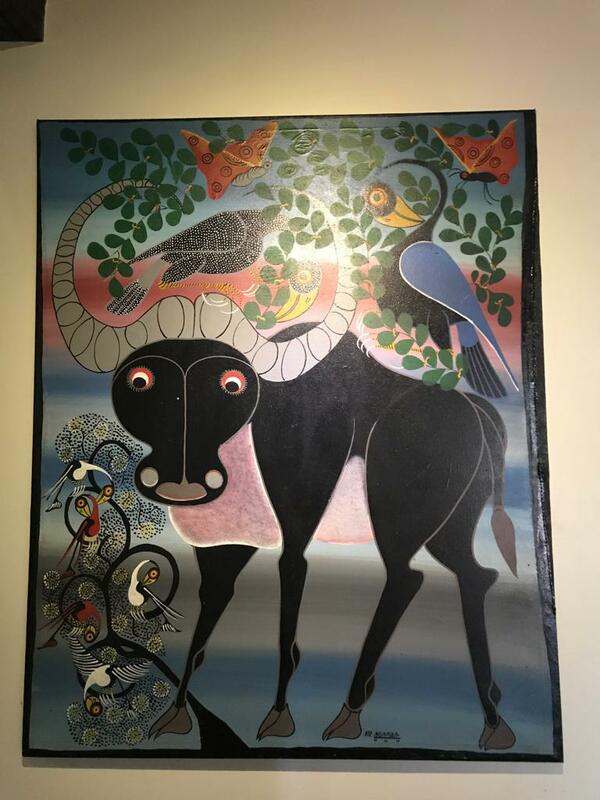 When we arrive, he has a table arranged for us outside among the trees in the middle of his beautiful farm with African coffee (coffee and milk boiled together) that is some amazingly delicious and is made with fresh milk from his cows. We sit and talk as he goes around the circle asking everyone where they are from and then telling us some fact about our city or state that we often don’t even know. We talk politics and given the fact that we don’t watch any television here or even keep up with the news, he usually tells us something that we weren’t even aware of. Tonight, he asked what we thought about Beto O’Rourke announcing that he was running of which none of us were even aware of at the time. 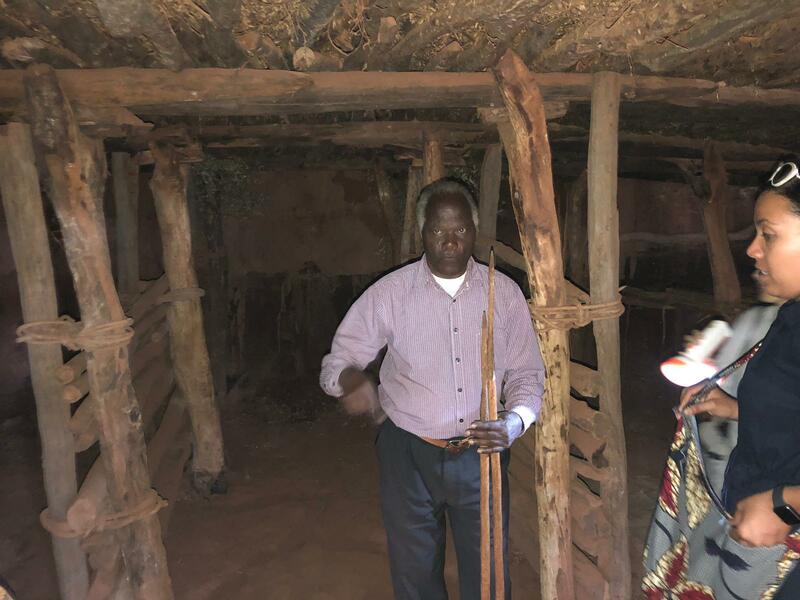 After sitting for some time, we walked over to the underground Iraqw home that he built in 1994, and which is a replica of the type of house that he grew up in before they were outlawed by Julius Nyerere after the country’s independence and the need to bring all 126 tribes of Tanzania into villages together to create a country. 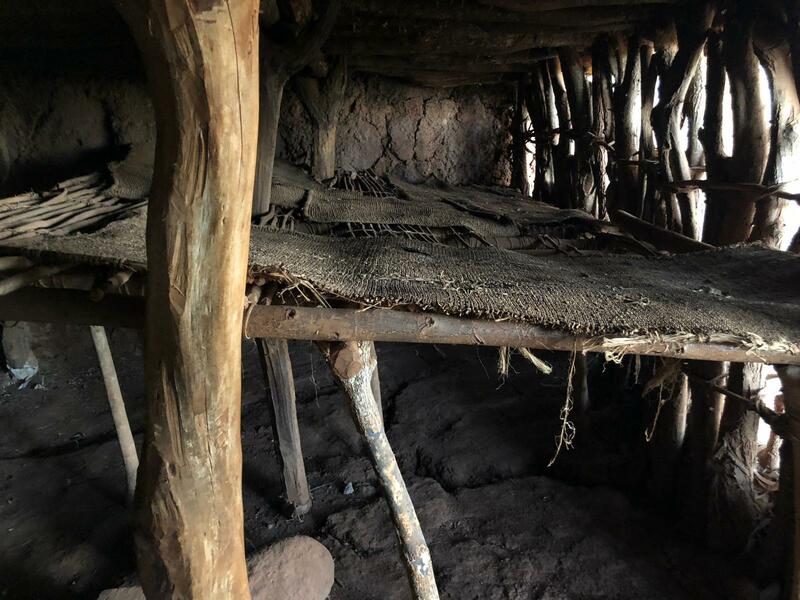 The houses were underground so as to protect their cattle, sheep and goats from the Maasai during the night. The Iraqw and the Maasai were at odds with each other until a truce was finally signed in 1986. In addition to Daniel’s Iraqw home, he also shared his methane gas collection system with the others which provides gas for cooking and lighting his home. It is a 10 cu. ft. collection tank that uses the waste from several cows to produce more than enough methane for his own use while also providing fertilizer for his fields from the byproducts of the process. It is an ingenious system that he has had for many years and that I had first seen in 2009. 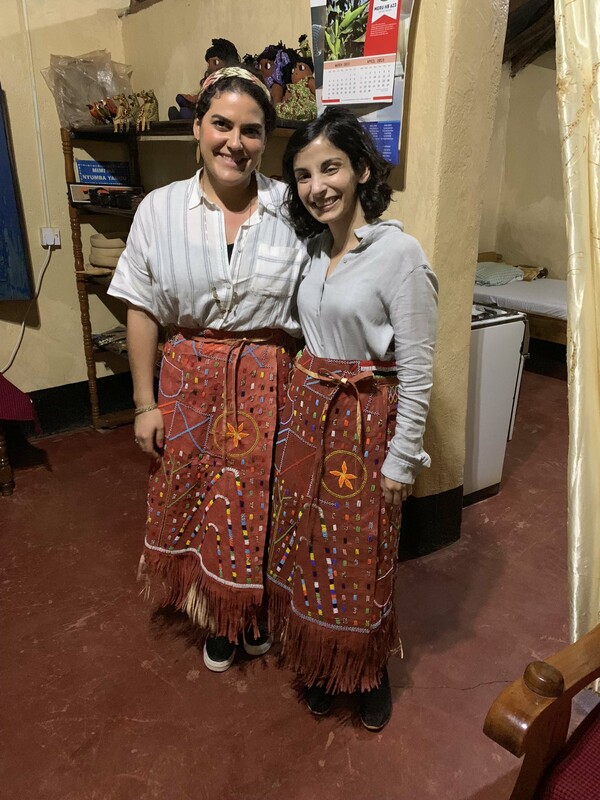 Later, we all walked to the nearby home of his eldest daughter, Isabella, where we were greeted as honored guests and served a wonderful dinner that was prepared specially for us. It has been this way for many years between us and there has been a relationship of mutual respect and gratitude. 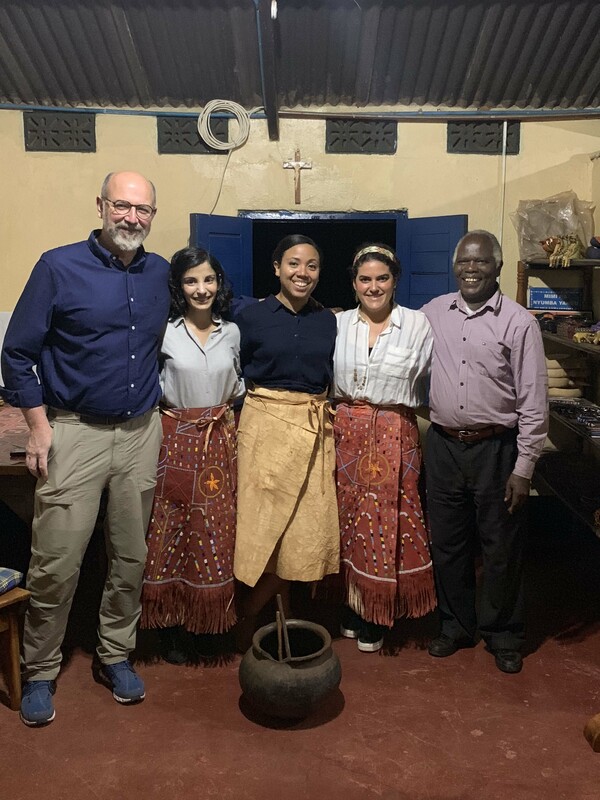 Though Daniel has continually reminded me of what I do for his community by bringing doctors here and providing care and that the honor is his, I constantly remind him of what he has done for us by sharing his home and family and teaching us about his culture. It is these relationships that we must treasure in life for they are the most genuine. There are no pretenses or expectations, only respect and love. Wednesday, March 13 – Is there really such a thing as hump day in Tanzania? It is Wednesday and we’re half way through our week-long clinic here at FAME with the mobile clinics to look forward to next week. The low volume has been a bit frustrating as I’m sure you can imagine, but the cases have been interesting and it’s been good working with Caren as I haven’t really had a chance to work with her much in the past. 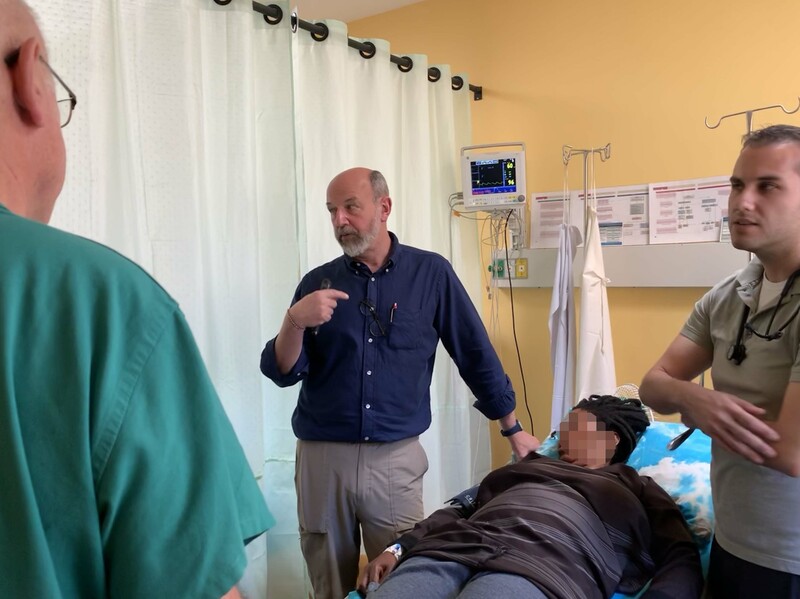 As I’ve mentioned before, it is our main mission to teach the clinicians here at FAME and when we are working with interpreters rather than a clinician, it is a lost opportunity to teach. Though it is great for us to see more and more patients here, the real impact and capacity building occurs when you teach a man to fish. When it was just me alone here, that wasn’t a problem, but as the program has grown over the years, with FAME growing as well, it has created a situation where they are more and more strapped for manpower which makes it more and more difficult for FAME to free up other clinicians to work with us. There are several solutions to this problem, but in the end, it has to do with funding, which always seems to be the case, and the only resolution that I believe will give us some immediate solution going forward will be for us to have a designated clinician or two who will continue to provide neurological care to our patients. 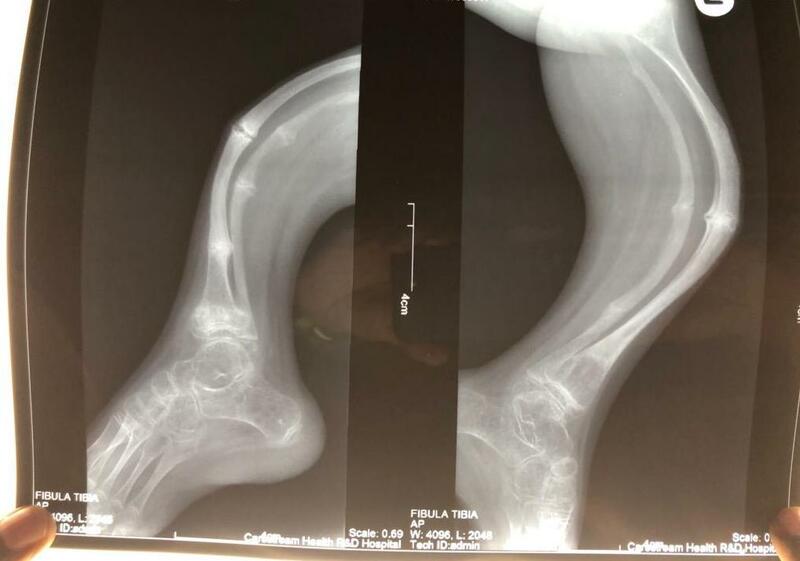 Frank had posed a question to me last week regarding which specialist would be most appropriate to follow an adolescent with osteogenesis imperfecta. I had replied that it would be a pediatric endocrinologist and pediatric orthopedist most likely, which was later confirmed by his speaking with one of his resources in the US, but at least I knew that it wouldn’t be a neurologist, let alone an adult neurologist. As things go here, though, it usually turns out that we will end up seeing patients like this just to help out with whatever we can. 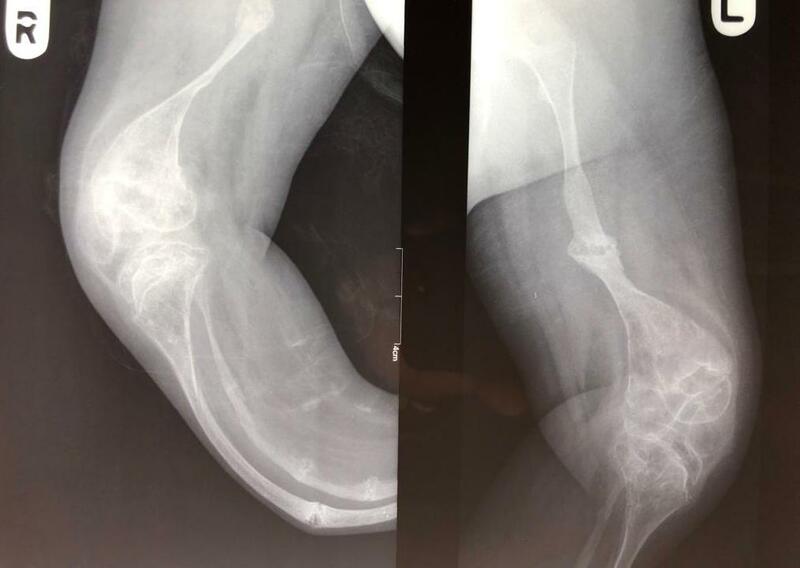 So, this young girl with very serious osteogenesis imperfecta arrived to clinic today after having traveled down from Arusha. 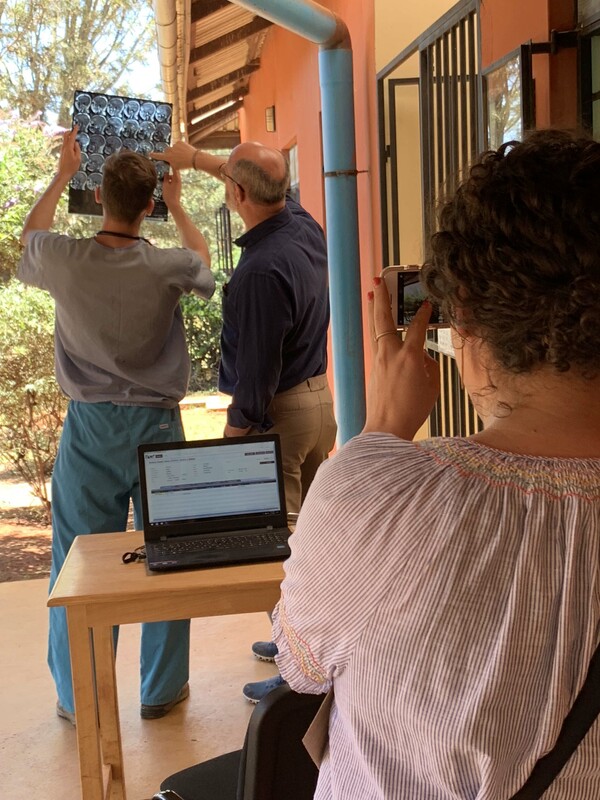 She was accompanied by someone from the international association who was working with her to navigate what exists of the health system here, and they came with many records and X-rays for us to look at to help with the evaluation. She did have some chronic pain symptoms that were certainly something we could help with, but beyond that, there was little from a neurologic standpoint for us to focus on. Regardless of that fact, both Marin and Dan did have some helpful thoughts about what could be done for her. Her disease was quite advanced and plans to do anything for her would have to take into consideration the real risk of doing harm in the end. Merely transporting her would poise an incredible to her well-being. She will absolutely need to travel outside of the country for something to be considered and it’s not entirely clear what that might be. We also had another little infant come who was somewhat younger than our last with the similar problem of static encephalopathy and poor nutritional status. 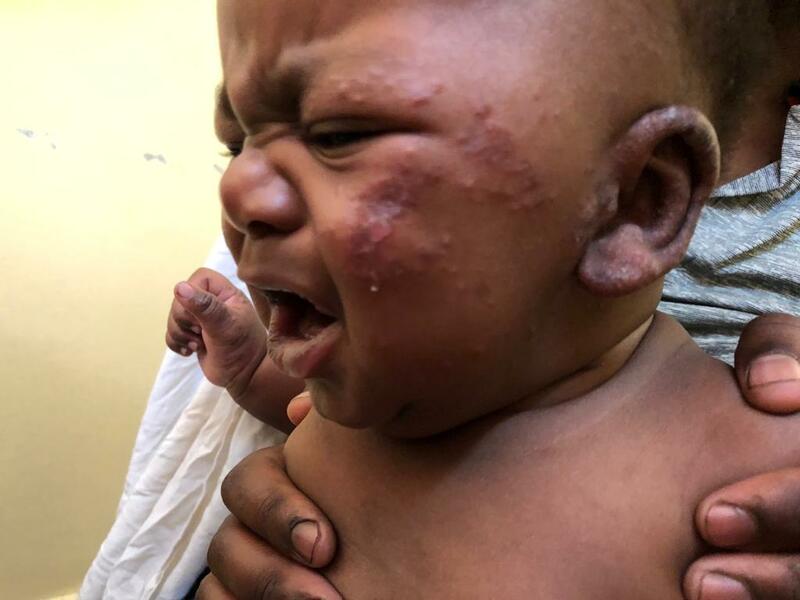 Once again, we contacted our sources in Arusha at one of the hospitals and were told that though they could see the child, the family would have to cover the cost of care. Though medical costs are most often very much less expensive here, they are typically going to be far outside of anyone’s or any family’s ability to pay. Patients will often go back to their communities to gain the funds necessary for some treatment which is the culture here. One of the lessons that are taught here is about unintended consequences and the fact that reaching into your pocket to help out, an act that we would consider the right thing to do, is not what one should do. It sends entirely the wrong message and rather than promoting self-reliance, it breeds continued dependence on others and is not sustainable in any sense. Though it is the ultimate intention to help others, without a plan and without first speaking with those who have been working in the area, it will most often lead to failure and heartache. There are many, many stories here of those wishing to help who have left in their wake millions of wasted dollars and nothing to show for it in the form of having made a positive change. Though this can be very frustrating, it is a lesson one must learn on Day 1. First and foremost, ask those you wish to help what is needed rather than giving them what you think they need. The latter tact will always end in animosity and lost friendship. The weather here for the last week and a half has been nothing short of perfect. 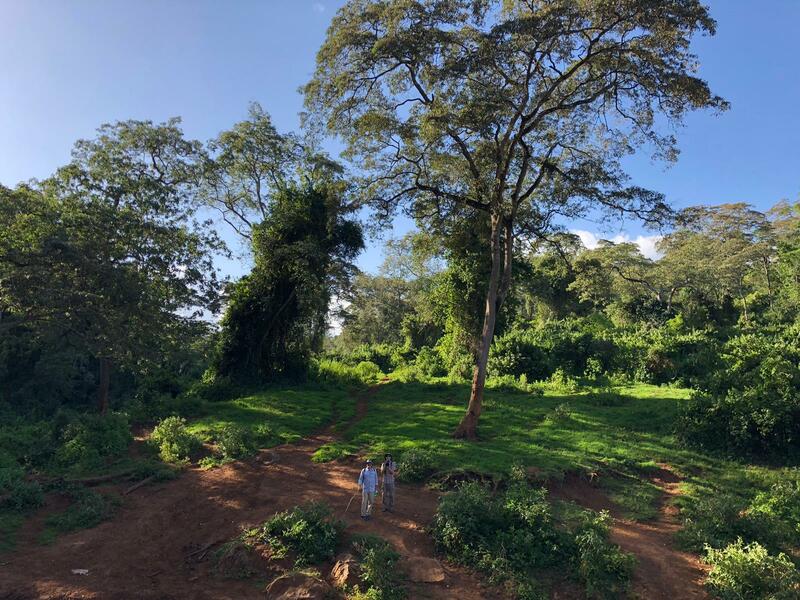 Outside of the first few days in Arusha and the heat, it has been just absolutely gorgeous – cool mornings and evenings, bright cloudless skies all day long except for a brief late afternoon rain shower, but we actually haven’t seen one of those in several days. The sun here is intense as we are just below the equator and it takes only moments in the direct sunlight to burn. We have no seasons here as we know them at home. Here, the seasons are known by their amount of moisture in relation to planting and harvesting. 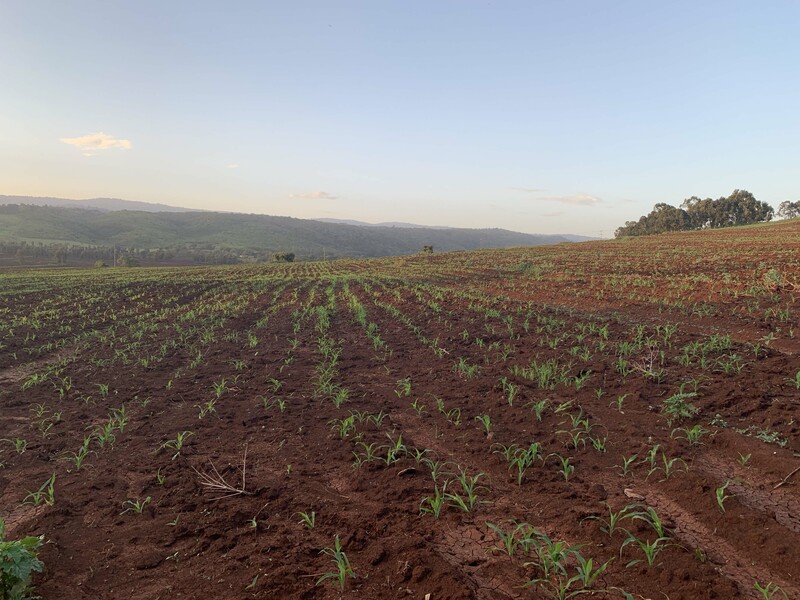 We are actually in the wetter season now where it is green and lush, there is less dust, and the planting is taking place readying for the rains of April and May. October when we have traditionally come, soon to be September this year and going forward, is much drier and dustier. Still, both seasons hold different benefits and both are lovely. As it is Wednesday, it is our Happy Day night. Again, this has been a tradition for several years for all the volunteers at the various sites in the area to mingle and share their “war stories.” It really is a time for everyone to unwind in the company of others of the same age and ilk. Everyone had decided to walk there tonight with the lovely evening, though I had to wait back at FAME as I was expecting to get Turtle back from the mechanic with its new emergency brake other small fixes. Soja, who is FAME’s mechanic, and has helped me with my vehicles for many years here in Karatu, brought Turtle back to me around 6 pm, which was perfect timing for me to drive him back to town and then meet Susan at the Lilac Café to chat. After my meeting, eating and catching up on some paperwork, I drove down to Happy Day with everyone sitting outside on the deck and lots of lively conversation already underway. The new and much appreciated addition to the menu at Happy Day is ice cream!! There are no good sources of ice cream here and it is something that is sorely missed. If only we could get a Baskin Robbins or Rita’s (the latter a Philadelphia favorite source of water ice and custard) here in Tanzania, I would gladly promise to support them on a regular basis. For now, though, a cup of vanilla and strawberry ice cream at Happy Day will have to satisfy my sweet tooth. As I sat down next to Sheena and across from Ann, there was already an ongoing and incredibly interesting conversation that also included Drs. Vic and Kelly. 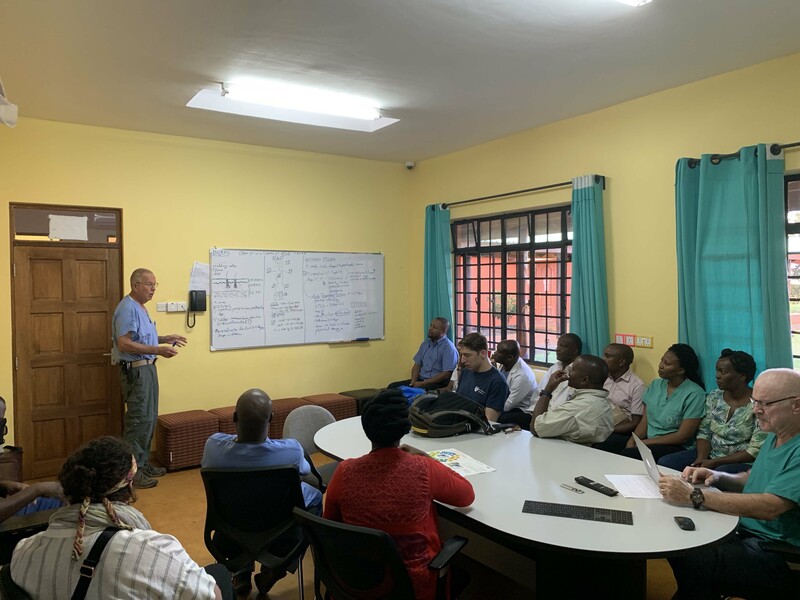 Dr. Vic Davis is one of Kelly’s mentors from her surgical training and has been here visiting at FAME during a brief interlude from his more long-term work with the surgical department at Muhimbili University. Vic has been working for many years, it seems, in practically every remote corner of the world with the International Medical Corps, among others, providing emergency and heroic surgical services just behind the front lines of war-torn locations. We were all in awe of his stories, which he told in such a matter-of-fact fashion that if you didn’t know better you’d think he was just related a normal day at the office. These were not glorified junkets as they to such locations as Afghanistan, Yemen, Somalia, Rwanda and Sarajevo just to mention a few. These were not considered vacation sites, and certainly not during his tenure in these locations. I think everyone who was listening at that moment found themselves thoroughly entranced and it became quickly apparent that what Vic really needed was a ghost writer to help him put all of this into a book. I would be the first in line to buy a copy of his book as it would tell a story of an incredibly unassuming physician’s true dedication to humanity. It was a privilege to be sitting with Vic at Happy Day this evening. Tuesday, March 12 – A ride in a bijaji…. It was another education morning, but today we were off the hook. Ann Gilligan, the nurse practitioner working with Every Mother Counts and who has also been working here at FAME to educate the doctors and nurses on birthing position, was placed in the lecture slot. And rightly so as she is incredibly passionate not only about the subject matter, but also the need for education in this area. Without going into detail, as I would undoubtedly oversimplify the subject, it pertains to the fact that how babies are traditionally born is not the most natural, nor the safest, of positions for either the baby nor the mother. She gave a wonderful lecture that completely held my attention for it’s entirely which is saying something considering that not only am I a neurologist, but also long past having any more children of my own. Everything just made so much sense and in the short time she has been here at FAME (one week) she has been able to teach a number of the maternity nurses how to assess babies in this fashion and actually worked with a mother all day yesterday to help her towards what was an incredibly smooth and quick first delivery. Hopefully, Ann will be able to come back in the future to work more with the doctors and nurses as this has been so well accepted on its initial run through. Kudos to Ann. 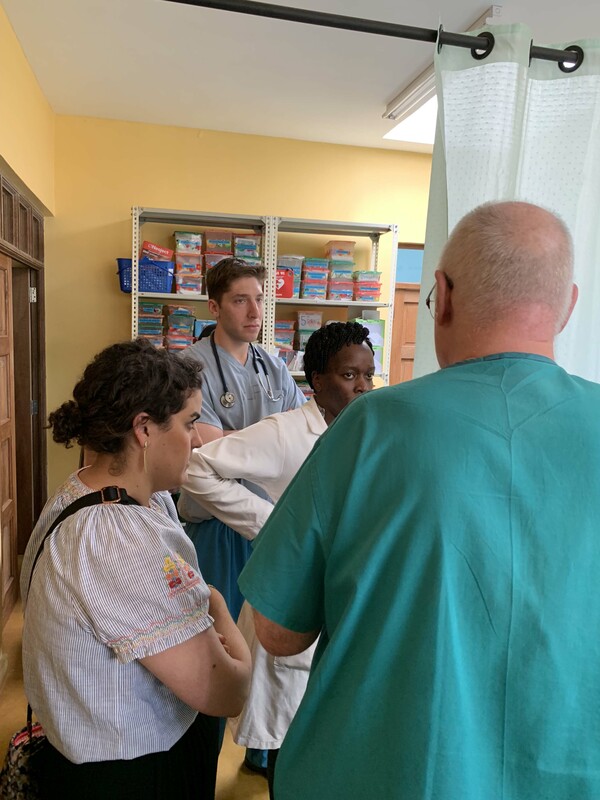 This was Dan and Marin’s first full day in clinic to see children and they were of such great help considering the number of children we see here. Children make up about 1/3 of our neurology patients here with the vast majority of them being either epilepsy cases or static encephalopathy and it is certainly great to have Dan and Marin available to see at least the latter cases, if not all. 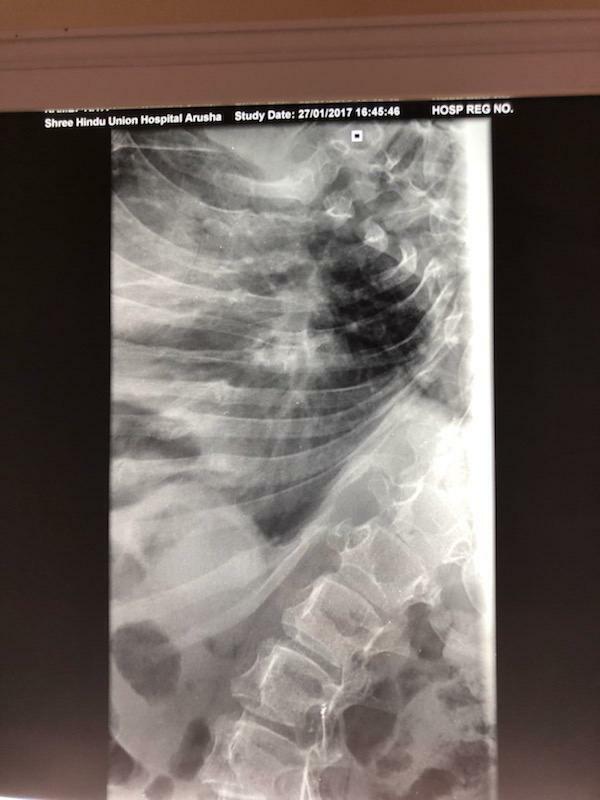 Marin evaluated a 2-year-old child with developmental delay who weighed only 6 kg and wasn’t not feeding very well at all because of her severe neurologic deficits and swallowing dysfunction secondary to oro-pharyngeal dysmotility. The child was repeated aspirating which was a huge issue and had gone from 10 kg a year ago when seen by us to her now 6 kg. 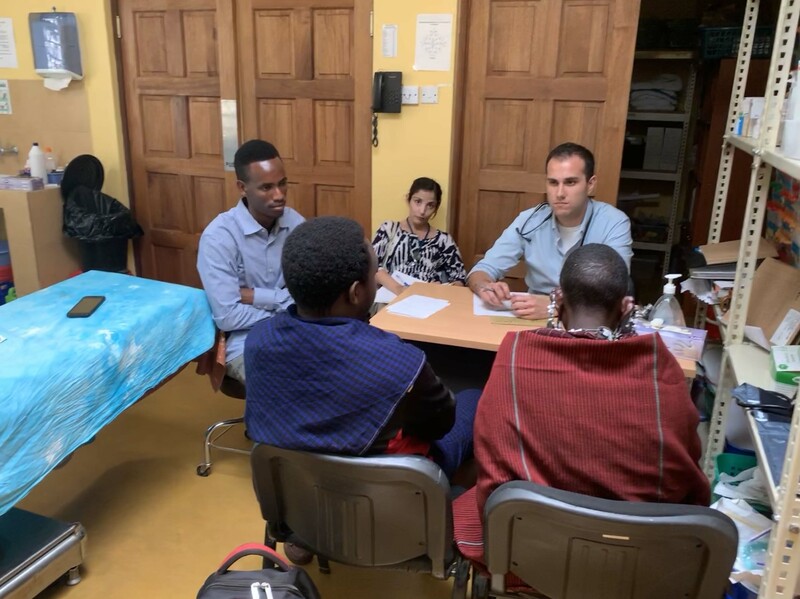 There was very little that we had to offer the child from our perspective, but they were clearly in need of assistance with feeding and I had remembered that in the past we had looked into referring a child to Selian Hospital in Arusha as they had a program to help these patients. I spoke with Kitashu, our social worker, who subsequently contacted the social worker at Selian, who then spoke with the pediatrician there. After a short delay, we were able to confirm that they were willing to work with the family. Though it may have only been a small success, it was one that we were all more than willing to take for it is these small success that are often the most rewarding. It is one step at a time. 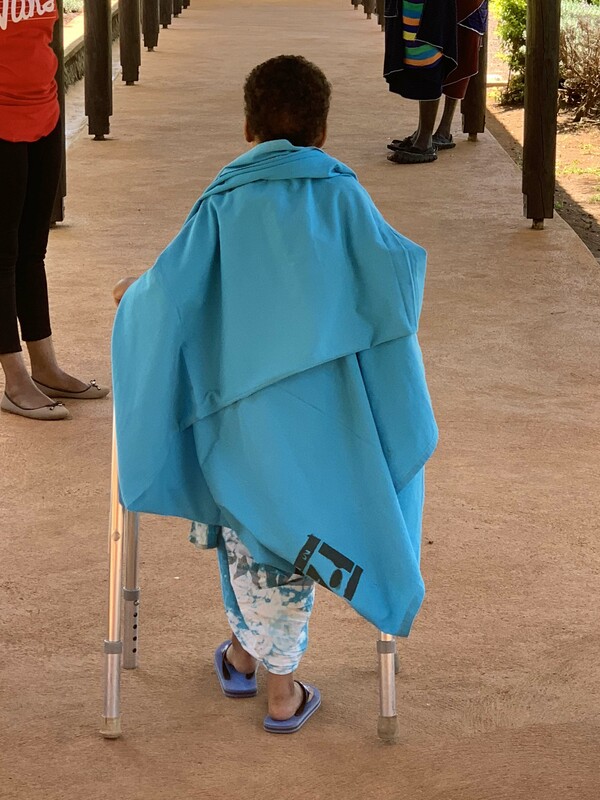 Though we had seen a moderate number of patients for the day, including children to keep Dan and Marin happy, we were still able to finish early and everyone had made plans to go to town to the one of the seamstresses that Katherine has been using to make her clothes. As I had work to do and blogs to write, I opted to stay back at the house. Besides, the mechanic had picked up Turtle (my Land Rover) earlier in the morning to fix a few minor things that included the emergency brake that had stopped working on Sunday. Not entirely necessary as long as you park in the right place and remember to leave the vehicle in gear, but still something that’s nice to have when needed. As I wasn’t of any use to drive anywhere without a vehicle, it offered a good excuse to accompany them and, besides, they had Katherine with them. I was told that it took some time to get everyone measured for everything that was ordered and, to be honest, I can’t say that I was sorry that I missed it since shopping for clothes isn’t one of my favorite things, unless, of course, we’re talking about REI in which case I’ll be the first to sign up. After they had finished with their shopping, everyone rode bijaji’s home from town. A bijaji is a three-wheeled vehicle that is like a combination motorcycle and small car. The driver rides up front and you can squish three into the back seat. 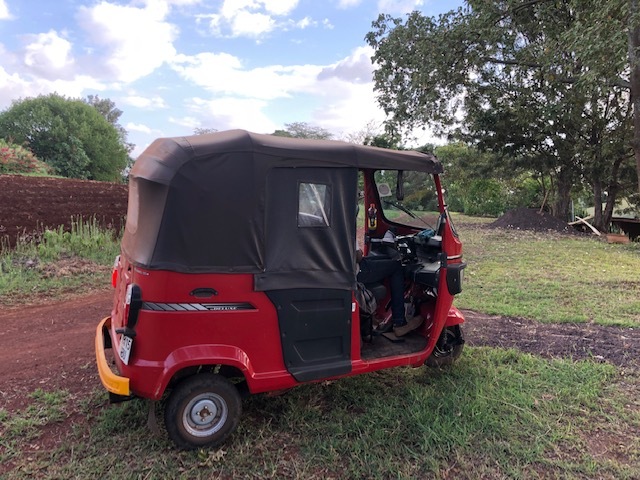 They have a motorcycle engine in them so that they are grossly underpowered and it wasn’t until the last several years that they’ve appeared in Karatu. 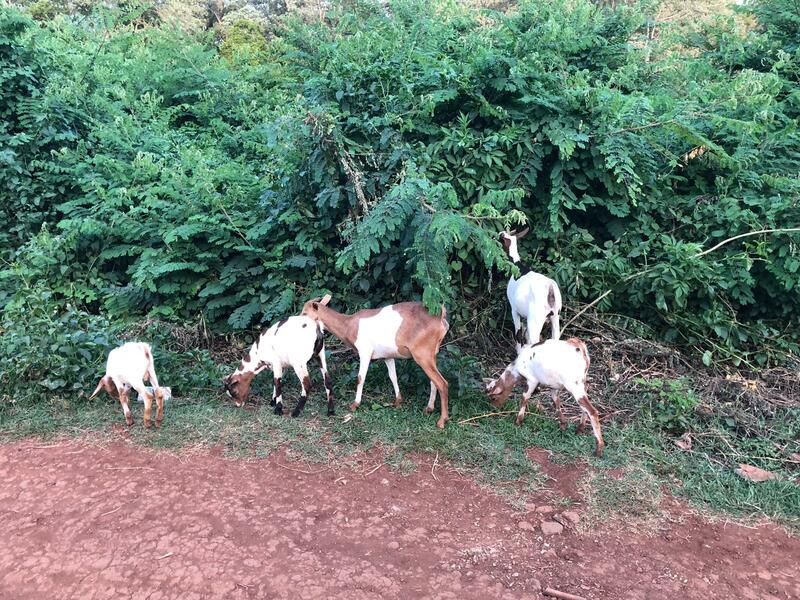 They were first in Mto wa Mbu for a number of years and slowly migrated up the hill just like swarm of bees. From another driver’s perspective, they are incredibly annoying as they drive on the side of the road most often, clogging up the flow of traffic and are usually in your way in the most inopportune times. They drive slow while at least the motorcycles, which are also annoying , drive at a greater speed and though they weave in and out of traffic, it isn’t necessary to watch out for them as they watch out for themselves. Leave it to say that I rued the day when the bijajis showed up in Karatu and they have in no way redeemed themselves over time. Having finished their “fittings” for their Tanzanian clothes, everyone decided to take the leap and ride the forementioned, infamous bijajis back up to FAME and, thankfully, everyone made it back in one piece. To honest, though, I have no issue with riding these vehicles as I am unaware of any significant risks, which is not to be said for the piki pikis, or motorcycles. Motorcycle taxis here are a huge business and probably transport the majority of passengers needed to get from point A to point B within Karatu and most cities and towns. At every small intersection you pass, there is always a cadre of piki pikis ready for hire, and, from what I understand as I have never ridden one, it is very, very inexpensive. On our last visit, Peter, the medical student who accompanied us and was living off-campus, used this mode of transportation on a daily basis and clearly survived to talk about it as he is alive and well in Philadelphia and without any PTSD from the experience. After arriving back to the comfort of our houses here at FAME, it was time for a bit of rest and relaxation. That is until Kelly, Vic and Katherine came walking by our house on a walk and asking us if we wanted to accompany them. It was an absolutely gorgeous evening with the sun about to set in an hour or so and an offer we just couldn’t refuse. Within minutes, we were all out of the house heading down the trail to our back gate to join the others on a relaxing walk through the fields behind FAME. There are small roads and trails that travel everywhere here as villagers use them to walk to work, in town or the fields, every day and even those that cross the fields and are tilled on a regular basis, are quickly reformed within days after their disrupted. The trails crisscross everywhere and, if you don’t know where your going, it’s very easy to get lost, especially if you are in a depression or small valley where you can’t see the hills to get your bearings. Worse yet, when the sun sets it becomes even more problematic as darkness falls quite rapidly and it’s easy to become disoriented. On my first trip here, I had decided to take a long hike to a distant ridge in the west to watch the sunset, later realizing that I had no flashlight and there wasn’t much of a moon. I had to walk the near hour back in total darkness through old coffee fields, imagining at times that the bushes were wild animals which do roam the area, and thankfully arriving back to my house well-after sunset, only to receive a strict tongue-lashing from Joyce and Carolyn, who were my housemates at the time and were worried sick about me. This walk was far more reasonable, though Sheena and I did take off on a fairly brisk pace ending up far ahead of the others who later texted that they were turning around and heading home as the sun was setting. Having spent more time here now, I knew that we still had plenty of light to make it home and, more importantly, I had a flashlight. 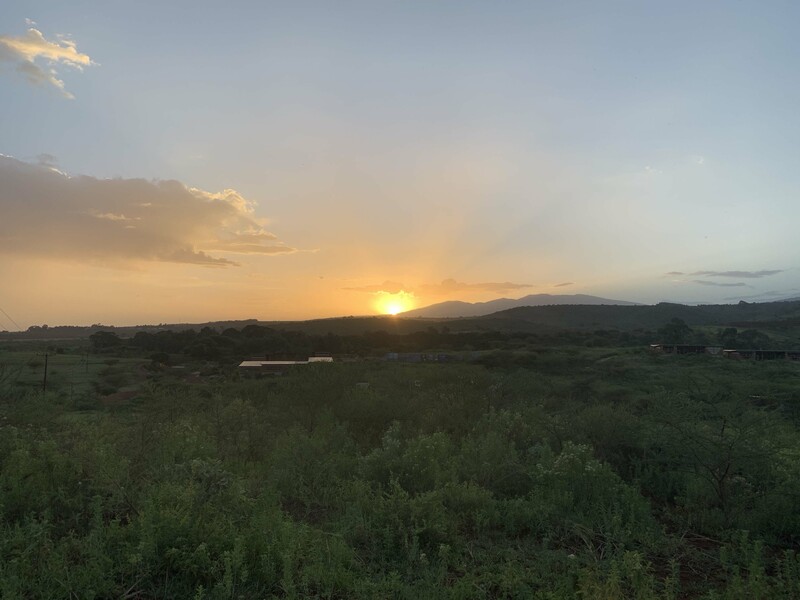 We walked to the top of the hill where there is a neighborhood so we could watch the wonderful sunset off to the west and bask in the warm rays of the setting sun. We were actually not that far from FAME so there was no opportunity for a reenactment of my earlier lapse in judgement. We walked home at a pretty good clip, partially to make it back before dark, but also as Sheena has been considering climbing Kilimanjaro at the end of her time at FAME and wanted some extra training. We joined the others sitting out on Joyce’s veranda, though by this time the mosquitos were coming out and the bats were circling our heads. Those were both excellent reasons to retire to the comfort of our living room, which we did in short order, to enjoy our dinners. Chef Daniel offered to take our vegetable wraps apart and to stir fry the veggies while also making fried rice, which most of us felt was a marvelous idea. His creation was worthy of a culinary award and quickly devoured by all. 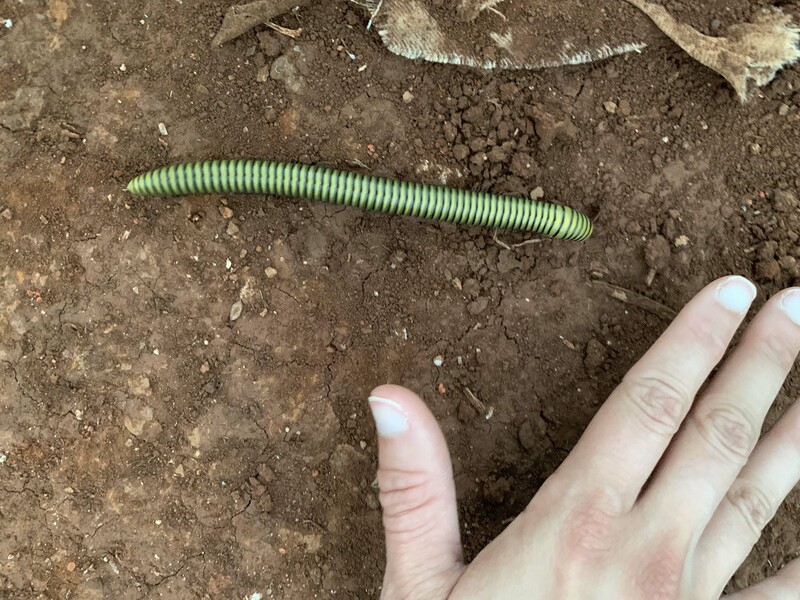 Monday, March 11 – A full week of neuro clinic begins…. 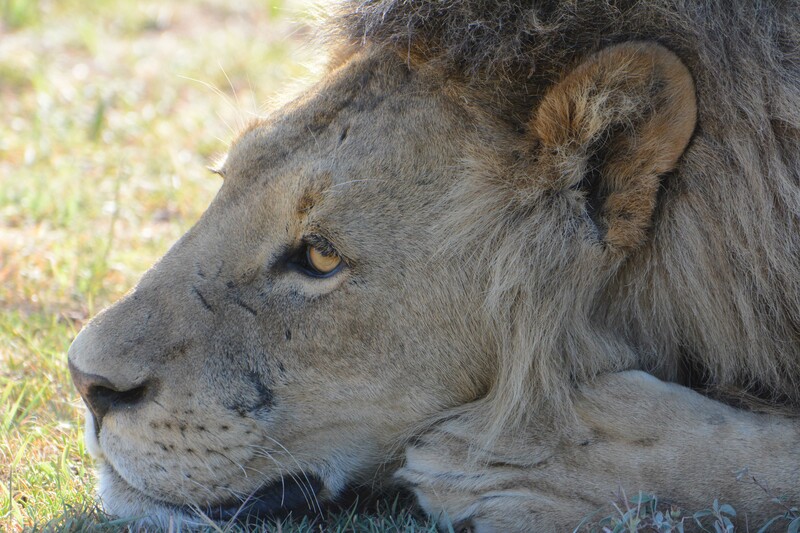 I think just about everyone had a hard time getting up this morning after the exhausting day on safari yesterday so it seemed like a longer walk to morning report than normal. We arrived to the conference room for report to find now one there so left to find out what was going on for the morning. 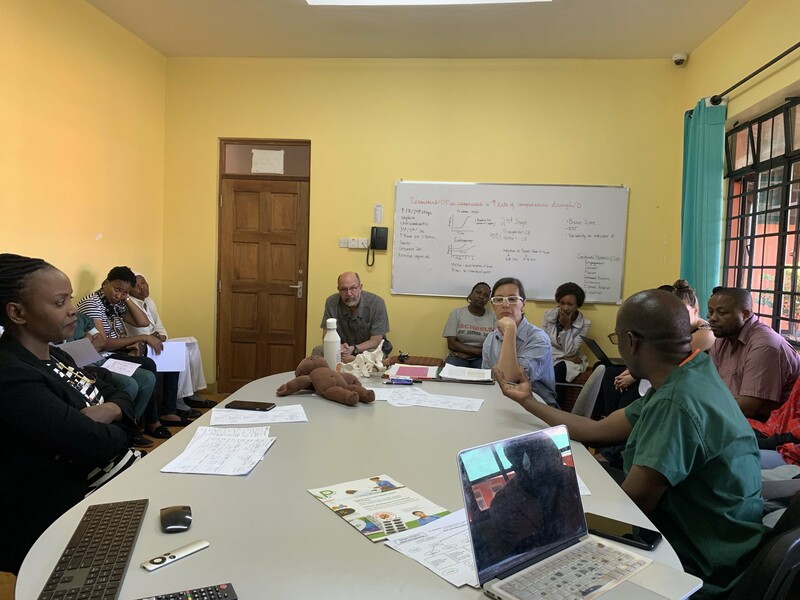 Bumping into Dr. Julius, we discovered that everyone was either attending the code going on currently in Ward 1 or was with the pre-eclamptic patient who presented with seizures in Ward 2. To say the least, it was going to be a very hectic day. We quickly discussed the other ward patients in morning report and then left to see what was in store for the day at the neuro clinic. Once again, there were far fewer patients there than I had expected and compared to what we have seen during past visits. 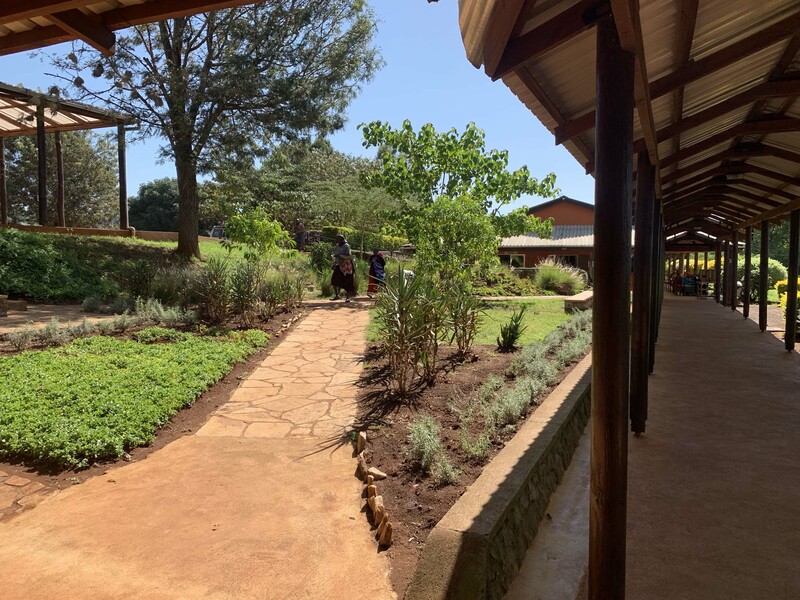 Given that we have the same outreach team that brought in over 400 patients last October, it must be the time of the year and the fact that it is currently planting season here. Patients must decide whether they can neglect their fields to deal with their health and most often, their health will come in second place. It is essentially a matter of survival and without their crops, they have very little else. So, back to the busy start of the day. 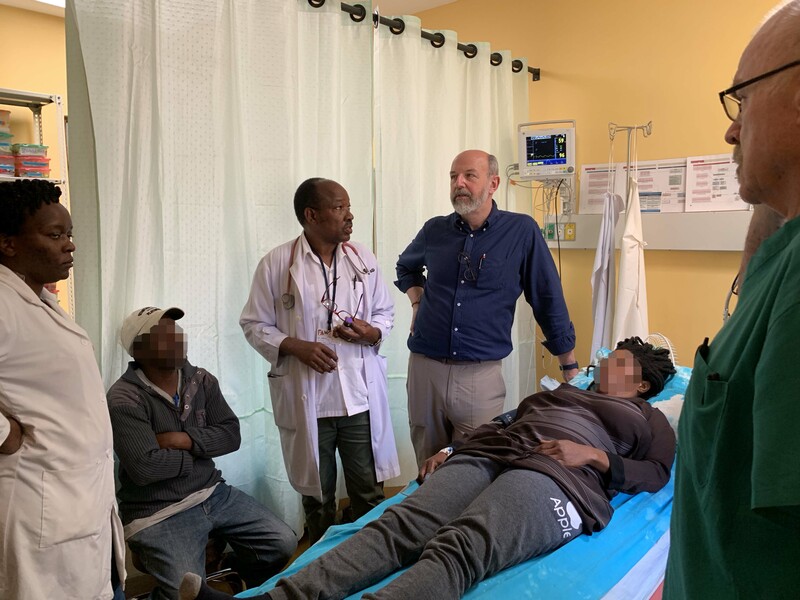 The ongoing code in Ward 1 turned out to be a young woman who had a history of about five days of gradually progressive confusion and lethargy, had presented to an outside dispensary where she had been treated and sent home. She had lost consciousness and was rushed to FAME the evening before. In the morning, unfortunately, she had had an arrest requiring her to be resuscitated and eventually intubated. She was now on one of the surgical ventilators in the PACU and without brainstem reflexes. Given the question of brain death, which is something that neurologists do routinely, it was just a matter of time before we were asked to see her. Daniel offered to do the evaluation and went over to the PACU to see her, and, as expected, found the patient to have no brainstem reflexes whatsoever. Unfortunately, there were several factors that also played a role in the decision making. Patients here are usually not intubated even during a code as there are no long-term ventilators for use in most institutions. As you recall, the baby last week had been physically bagged all night as there was no pediatric ventilator available and the same situation existed for this patient in that there was no long-term ventilator available for her regardless of what anyone would have wanted. 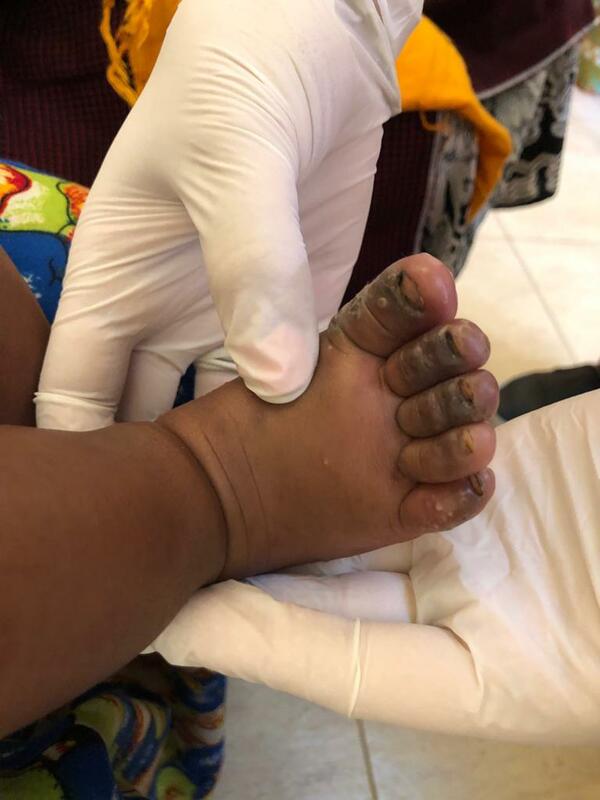 This is a basic problem all over Africa in that there are no facilities that can manage these patients requiring this care. I’d fight long and hard if we had a patient with Guillain-Barré syndrome come in needing ventilation given the knowledge that would be expected to recover fully. On the other hand, this patient, now without brainstem reflexes, meaning that she was unable to breath on her own, had an extremely poor prognosis even in the best of circumstances. Dr. Gabriel had spent a significant amount of time with the family to explain the gravity of the situation and prepare them for the fact that their family member was not going to survive. Her ventilator was eventually removed with the family understanding that would pass and that it was clear that she was brain dead, meaning that we had determined death by neurologic criteria rather than the more common cardiopulmonary criteria. Things don’t always go this smoothly with the decision making, of course. Her presentation, Daniel felt, may well have been that of meningitis given her encephalopathy for several days, and given that it hadn’t been fully treated until she arrived to FAME, her prognosis from the get go was incredibly poor. After dealing with this patient, we were peripherally involved with two patients who had also presented with pre-eclampsia, but were doing well as they had both delivered. 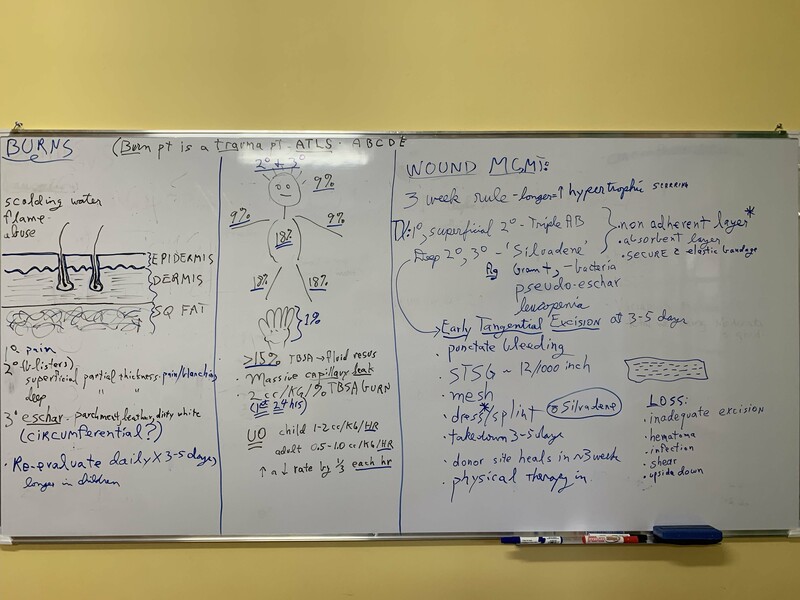 In addition to this, there was also a woman who presented with abdominal pain and was eventually found to have a rupture ectopic pregnancy with a very large hemorrhage requiring her to take a trip to the operating theater to stabilize her. 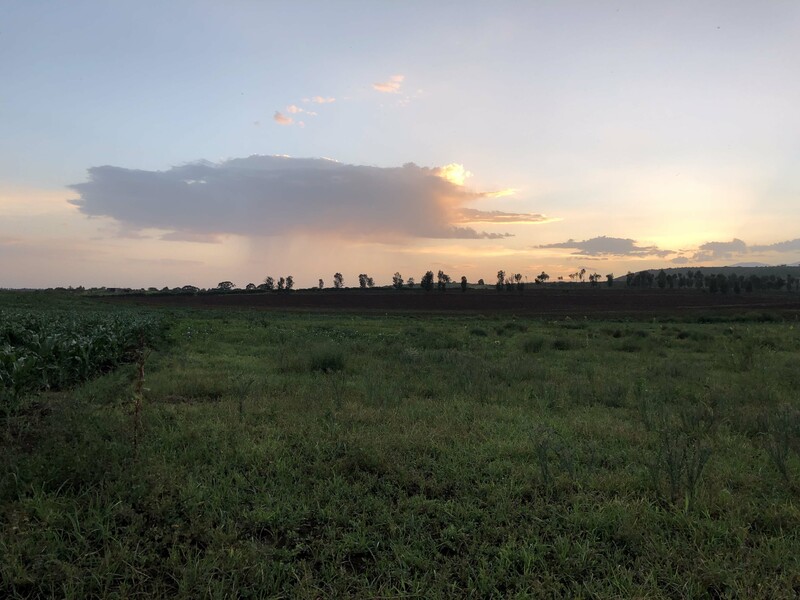 It was a very hectic morning for the FAME staff and since things were rather slow for us once again given the vagaries of the planting season here, we were happy out with some of the patients as best we could while staying in our comfort zone. No worries, though, I did not send any of my residents into the OR to assist. The closest thing we have to that here is Jon, soon to be a neuro critical care fellow, who is always more than happy to volunteer for any potential procedures and so far, has been incredibly helpful with the ultrasound machine here looking at hearts and optic nerves (for increased ICP). We haven’t provided him with any central lines yet, much to his dismay, but you never know. We had a number of children to evaluate this morning, which was fine as they were all relatively straight forward, but it was a bit frustrating as Dan and Marin, our pediatric neurology team, would be arriving around noontime today. One of the children we did see was a little baby with a question of developmental delay as the mother was concerned he wasn’t walking at 12 months since her other children had walked at 9 months. The walking issue was of no concern to us since they were still well within the range, but there were other much subtler signs that were present that did raise some level of concern. It still wasn’t 100%, though, and neither myself nor Adys felt that we say one way or the other. Hence the need to have a full pediatric person with us here as it has always been my contention that I am comfortable evaluating children, but admittedly feel less confident when it comes to floppy babies or early development. Thankfully, Dan and Marin arrived around noontime as expected and were both prepared to see patients that afternoon, though we only had a few. They had been traveling for several days to get here, making a small detour in Dar es Salaam, but eventually arriving safe and sound into Kilimanjaro International Airport. After having spent the night at the KIA lodge, they were awake and on the road early to join us here for two weeks and the bulk of our clinic. Dan is a pediatric neurologist from Children’s Hospital of Philadelphia, who graciously offered to accompany us for this visit as we didn’t have a pediatric neurology resident along to help with the children. Marin is primarily a pediatric inpatient neurology nurse practitioner, who I am told pretty much runs the ICU service at CHOP, and has been incredibly enthusiastic about the possibility of accompanying us here and has finally made it happen. Given the rather slow nature of the day, we took the opportunity to run to town for some fabrics as everyone was interested in having some clothes made by one of the shops in town. 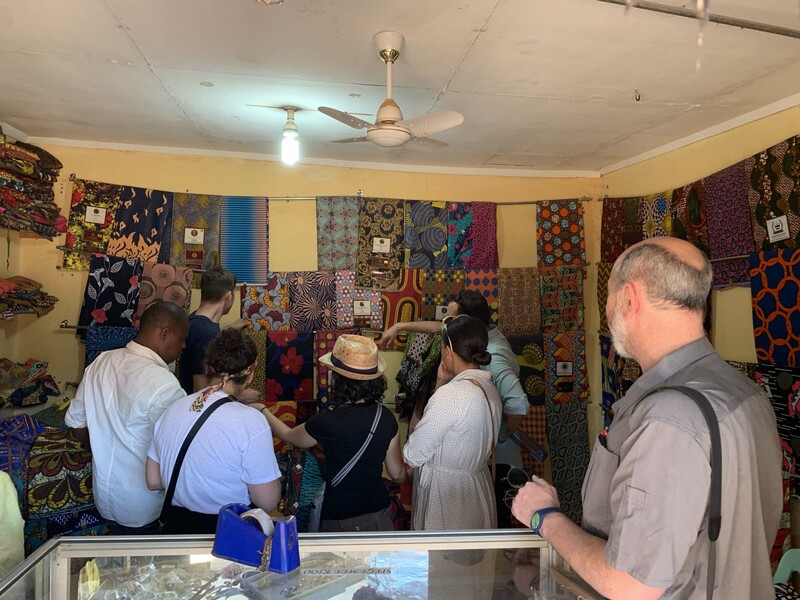 The fabrics here are incredibly colorful and beautiful and there are many, many shops downtown that offer a wonderful selection of patterns and then it is merely a matter of trying to describe to one of the tailors what it is that you would like to have made. That can often be an issue, though, since most of the women at the shops do not speak English and it’s always just a bit nerve wracking hoping that they understood everything you were trying to convey. Today was only a fabric buying trip and that would not be difficult. Phoebe accompanied us all downtown and in very short order, there was agreement on which fabrics were being purchased. Going to the dressmaker or tailor would wait for another day. I had told Kitashu to call me if any patients came in for us to see while we were away and he called at just after 4 pm to let me know that someone had arrived. Adys agreed to see the patient with Dr. Carin and it turned out to be a woman with what appeared to be some cognitive impairment when they took the history and she was initially thinking about a neurodegenerative process. The more that Adys got into the history, though, it seemed that the confusion was episodic which wouldn’t necessarily be consistent with a diagnosis such as this. After further questions and the recognition that the patient had underlying diabetes mellitis, it was decided to check a blood sugar. Thank goodness they did as her random blood glucose was 18 (!) meaning that she was severely hypoglycemic and at great risk of suffering injury if it weren’t corrected immediately. We whisked her to the emergency bay to get an IV started and gave her fluids and D50 and within moments she began to perk up. Though she had improved with the D50, I believe it was decided that she would come in the hospital overnight to make sure that she was stable. It was disaster averted and just reinforces the fact that you have to look at the basics first before you begin to consider other things. Had that patient had to wait much longer for us it could have been a very serious problem. 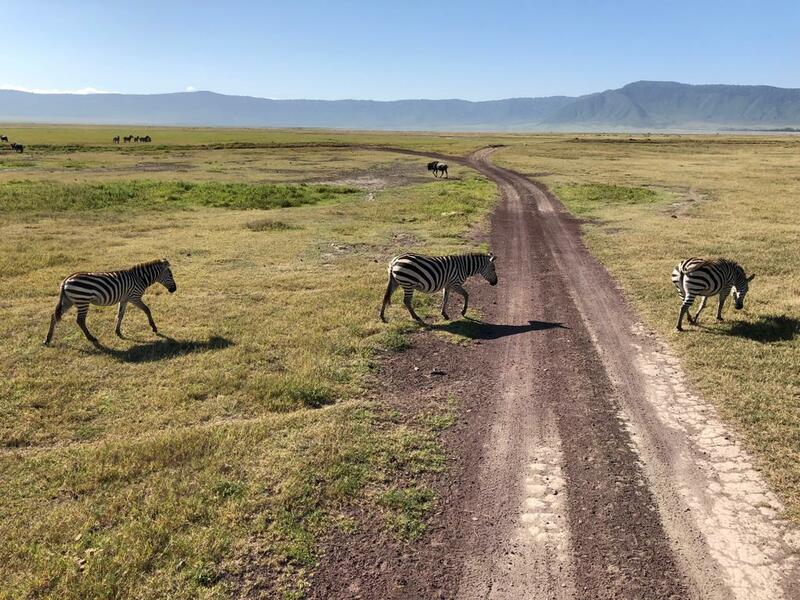 The old adage, “if you hear hoofbeats, don’t think of zebras,” doesn’t necessary translate in this part of the world given the number of zebra we see here every day, but it still conveys the necessary concerns of thinking of the basics first.